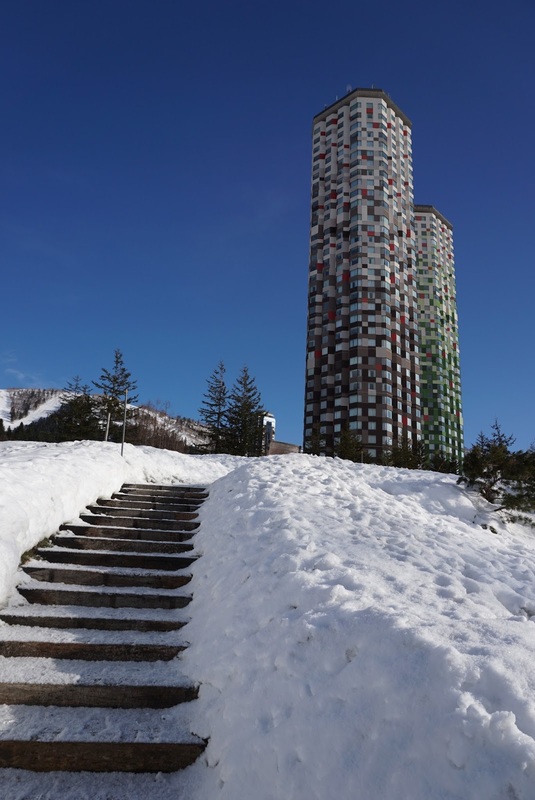 Kohan Tei is located in the East part of Tokyoka Onsen, which is about 25 mins bus ride from Toya JR Station. 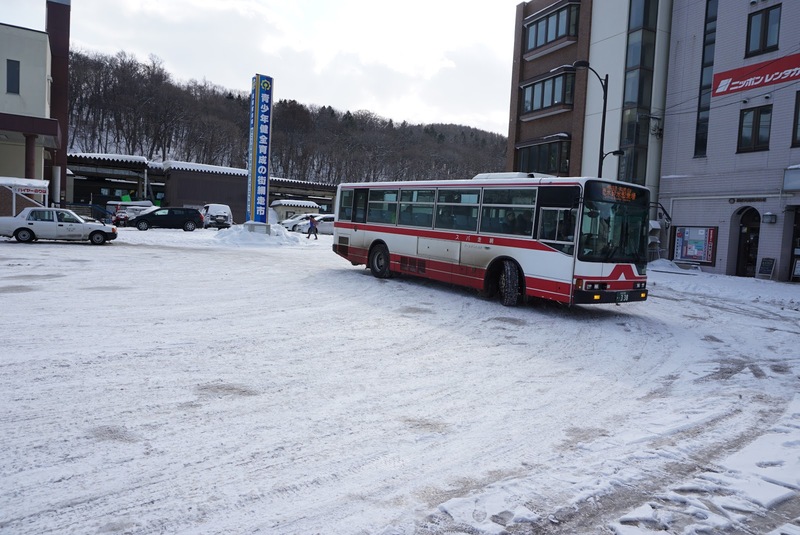 There is a bus stop, Moto-machi where buses run from Toya JR Station, right in front of the hotel. 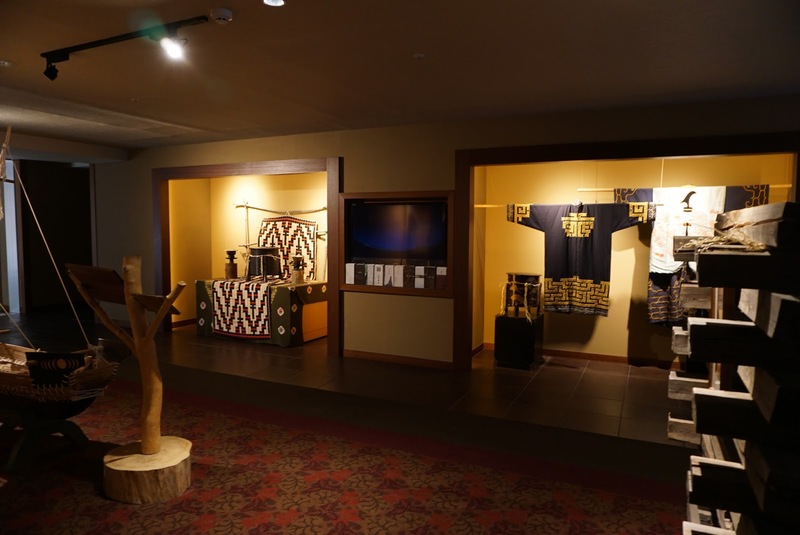 Kohan Tei is situated right in front of Lake Toya, and has a 24-hour convenient shop within 2 mins walk from the hotel. 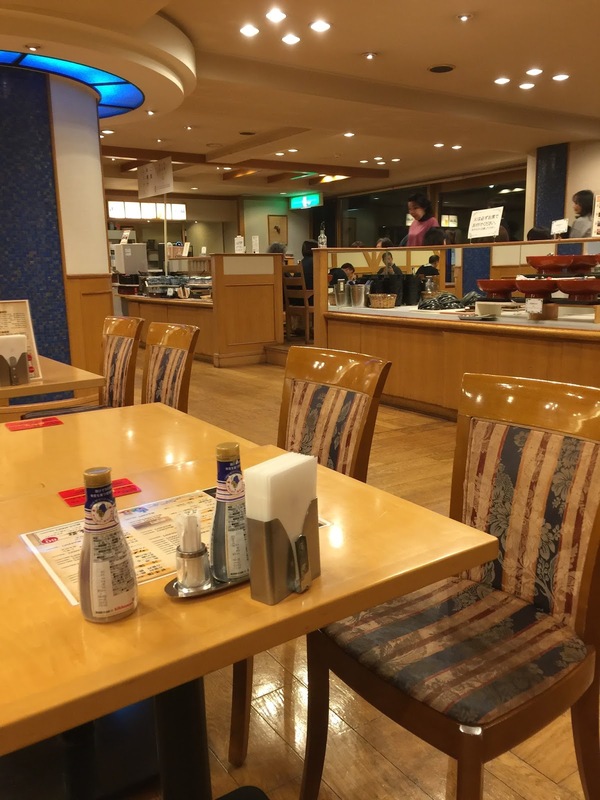 However there are not many restaurants around the hotel. Most of the restaurants are located near Toyako Bus Terminal, about 15 mins walk from the hotel. 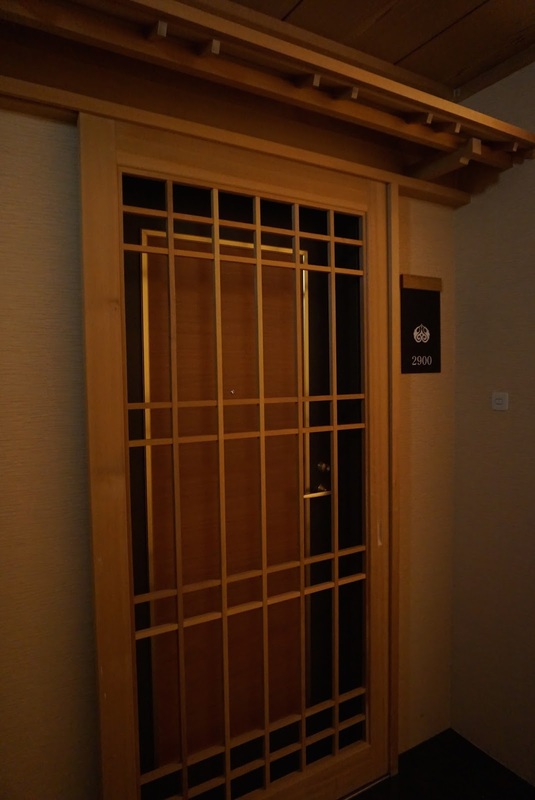 A common feature with Japanese style rooms in most hotels, the porch is the first thing I came across inside the 15㎡ Japanese Style Room in Kohan Tei. 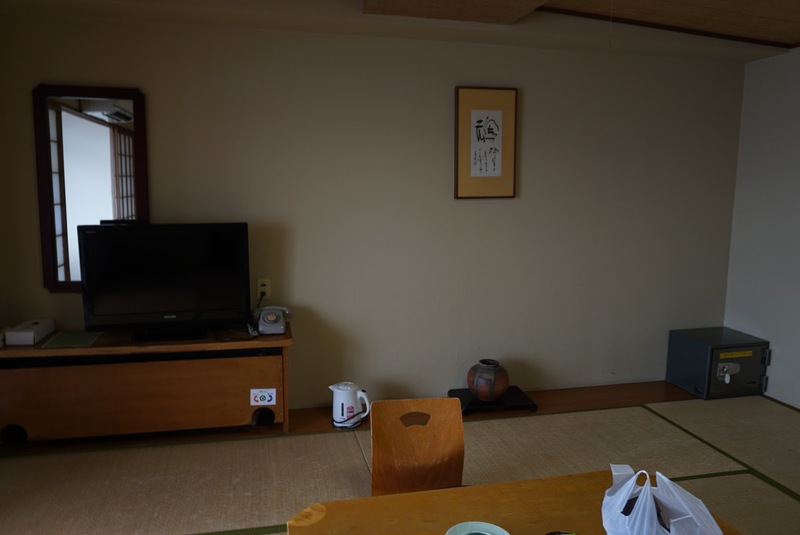 This is an area where shoes are to be removed before entering the room through another Japanese style door. The futons are kept in the cabinet on the left of the porch, while the bathroom is located on the right side from of the porch. There are no shoe ranks for us to put our shoes. 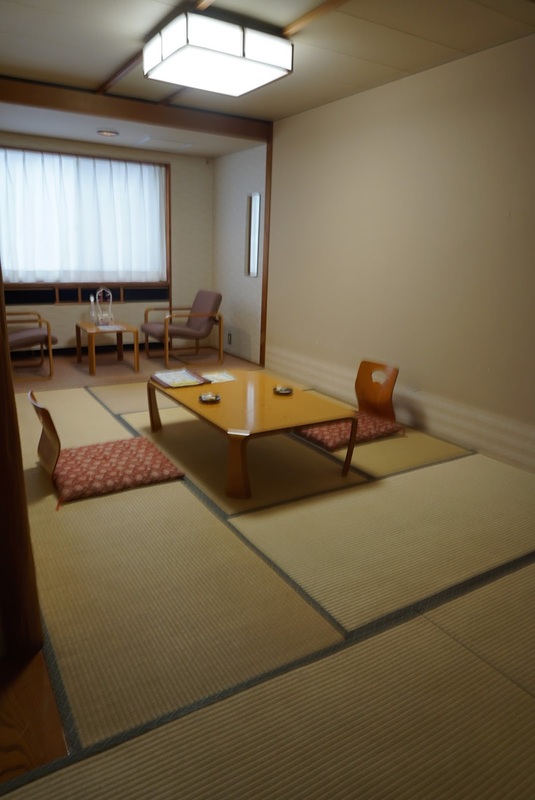 Passing through the Japanese style door, a small knee height table with 2 chairs are placed in the middle of the sleeping area. 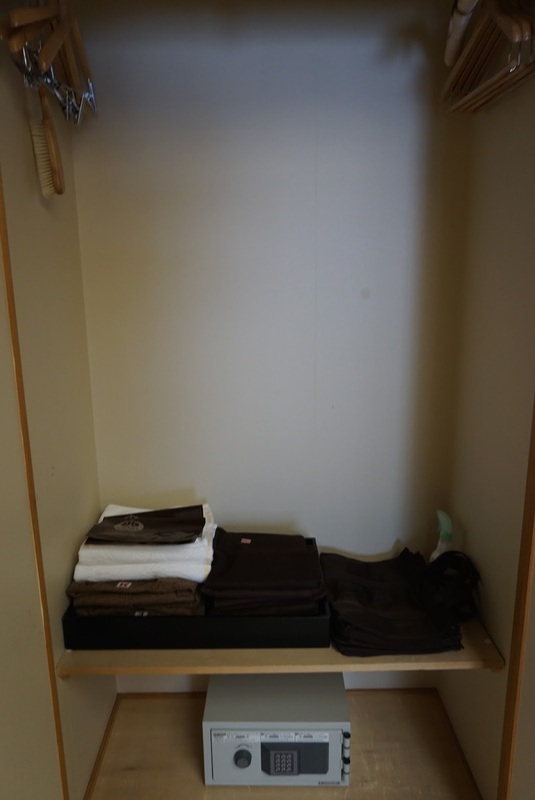 The wardrobe is built into the wall on the left after passing through the Japanese style door. The cabinet is rather small which can only hold up to 4 winter jackets. 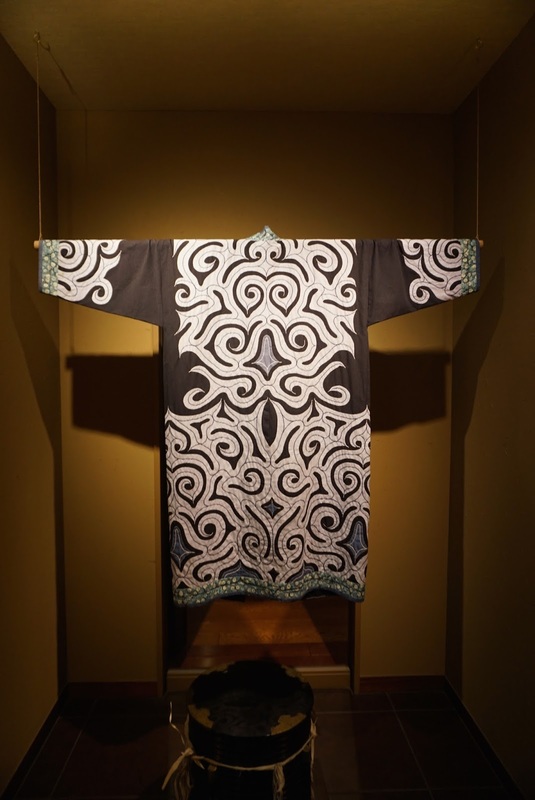 The yukatas are found in the wardrobe. 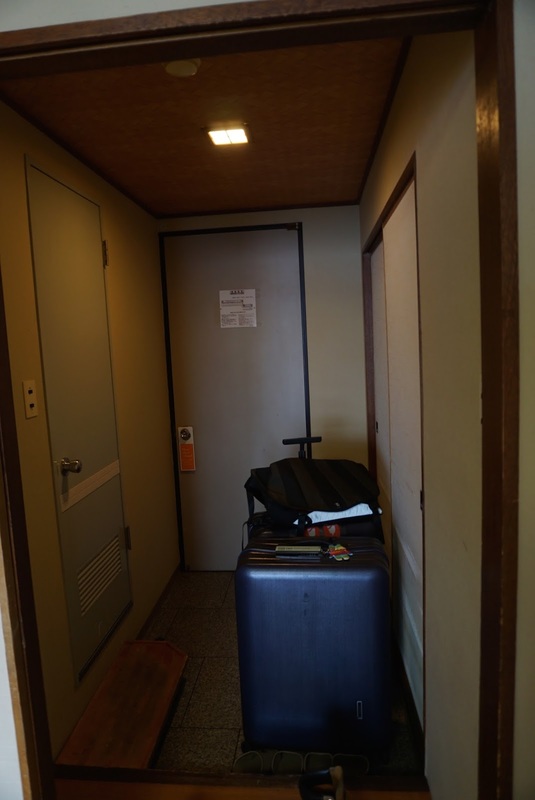 To the right of the inner Japanese style door, the in-room safe sits in an open space in one corner of the room. 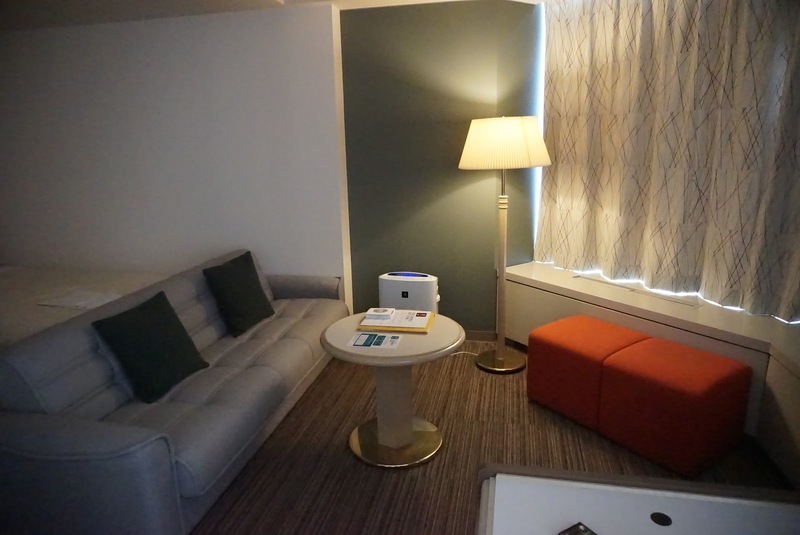 The TV console is placed along the wall on the right side of the room with a old school dial in-room phone. There are only 4 power sockets in the entire room, 2 are located in the sleeping area, where one of which is used for the TV. 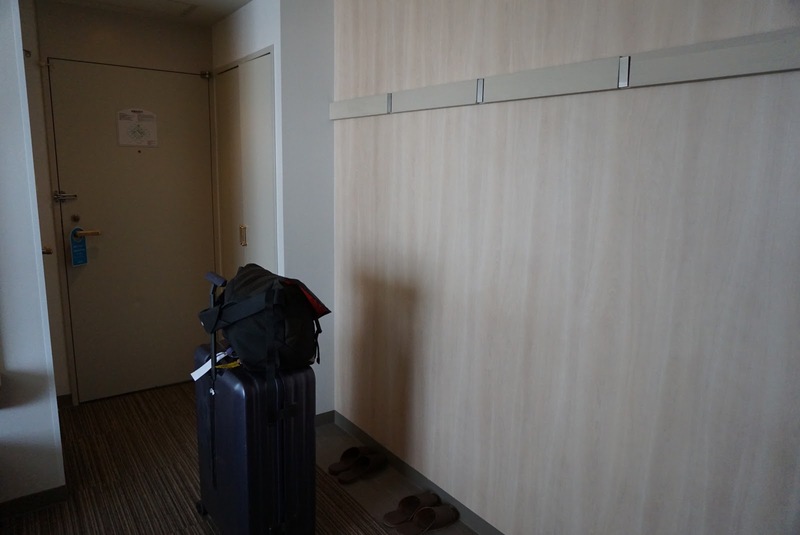 There is another door separating the lounge area from the sleeping area. The lounge area overlooks Lake Toya with the floor to ceiling glass door that opens into the small balcony. There are 2 arm chairs and a coffee table placed here. 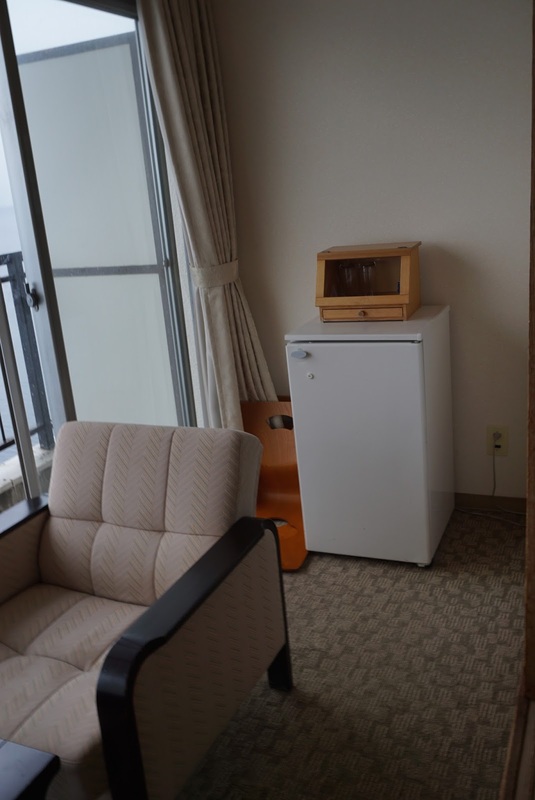 The in-room fridge is placed in the lounge area, behind one of the armchairs, along the wall on the right side of the room. The lounge area is a great place to relax in as it looks out into the beautiful Lake Toya. There are 2 more power outlets here, one of which is used for the fridge. 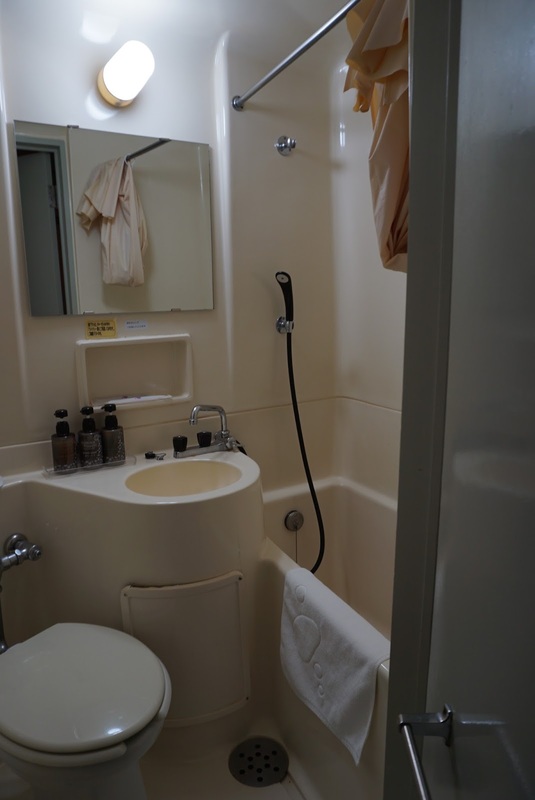 The bathroom in Kohan Tei very small and looks like it needed an updating. 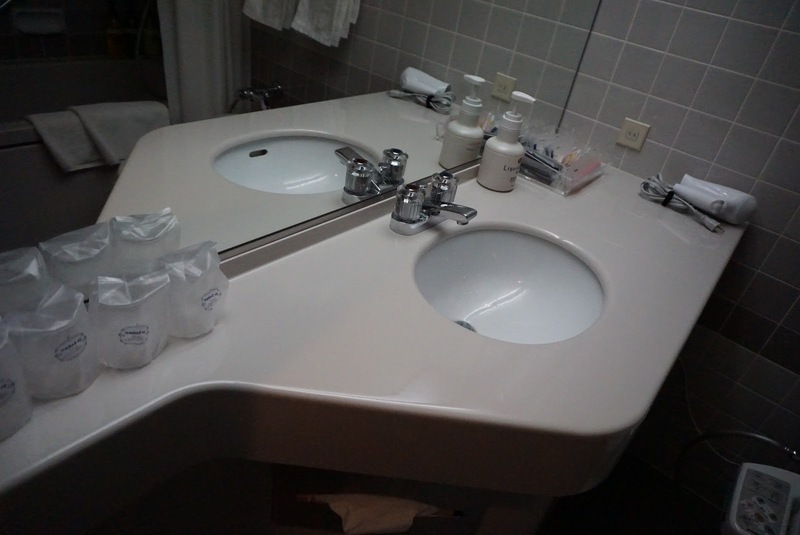 There are no washlet toilet bowl, just regular toilet bowl which is very cold to sit on in the cold winter. The sink is located next to the toilet bowl and the panel on the sink looks as if it is going to fall off any moment. The bathtub is next to the sink, where showering is to be done with the only shower head in the bathroom. 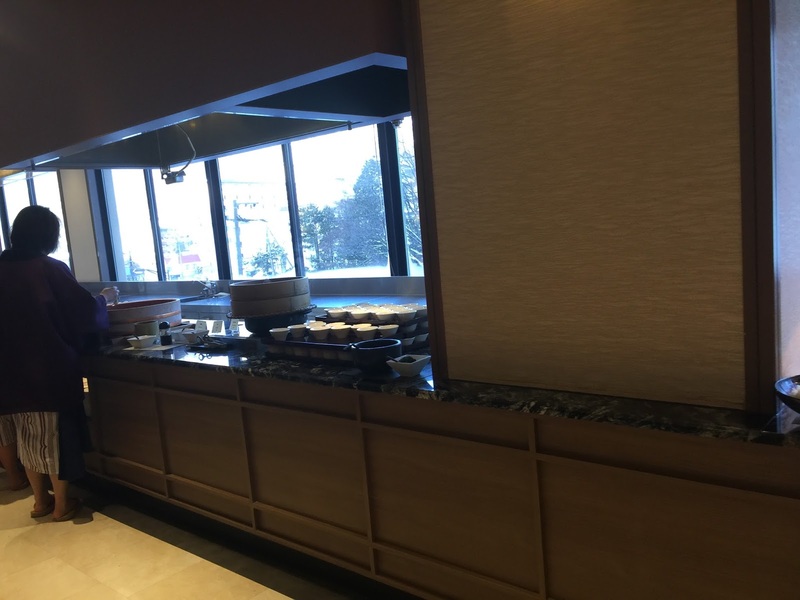 The rate that I booked included breakfast and dinner is served at either the buffet hall on level 2 or the restaurant at level B1. 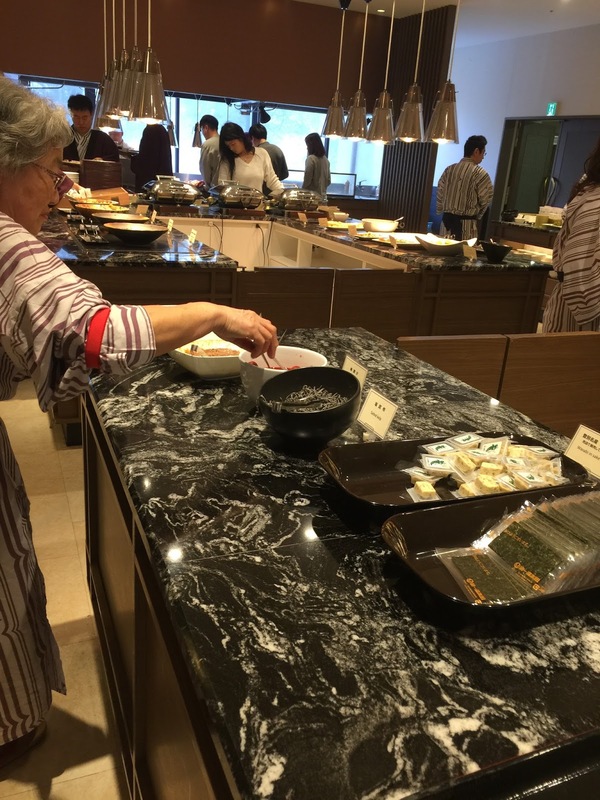 We were initially assigned the buffet hall at level 2, where the hotel caters mainly to tour groups or non-Japanese independent travellers. 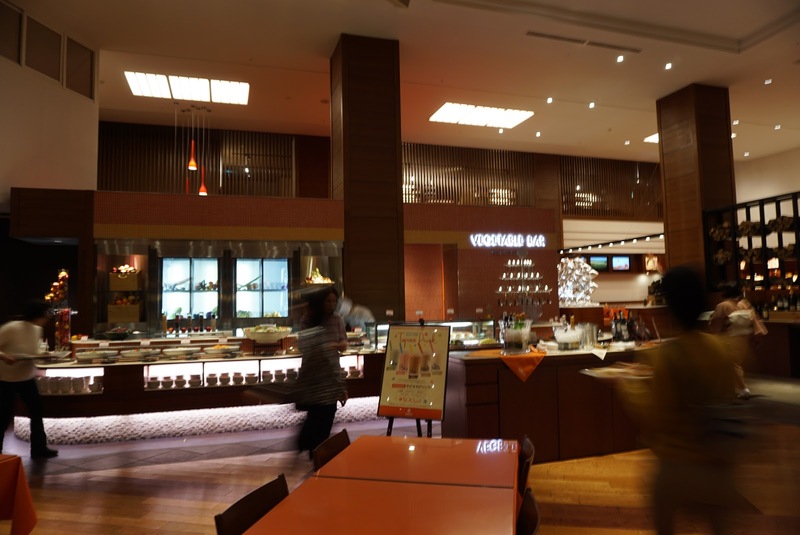 There is a large variety of Japanese and Chinese food served in the restaurant at level 2. Tempuras are freshly fried in the buffet hall, which makes it rather smokey and clothing will rake of fried smell. The food is good but due to the hordes of Chinese tourists assigned to this hall, dinning here feels like a race. Forget about obeying the queue as the tourists tend to cut queue and shove themselves to get the food they want. 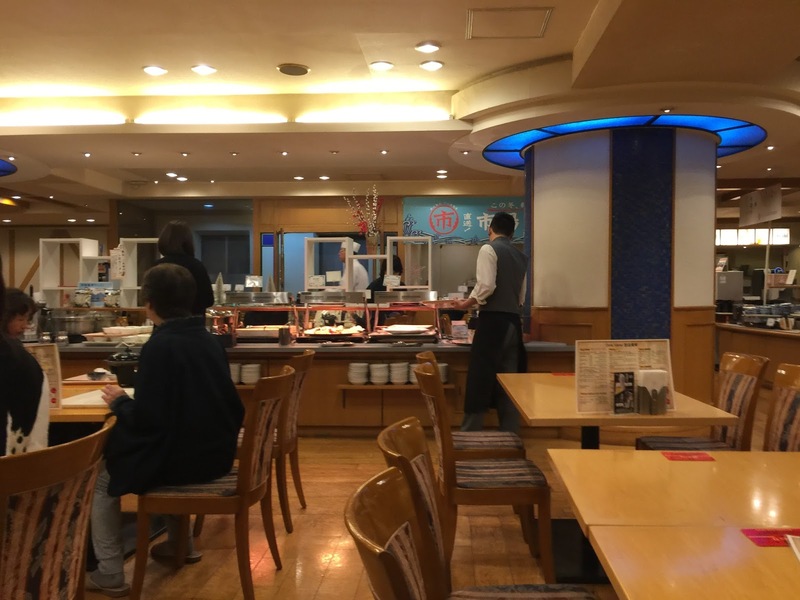 We were subsequently assigned to the restaurant in B1 due to service we received at the buffet hall (read about it below), which serves mainly Japanese guests. 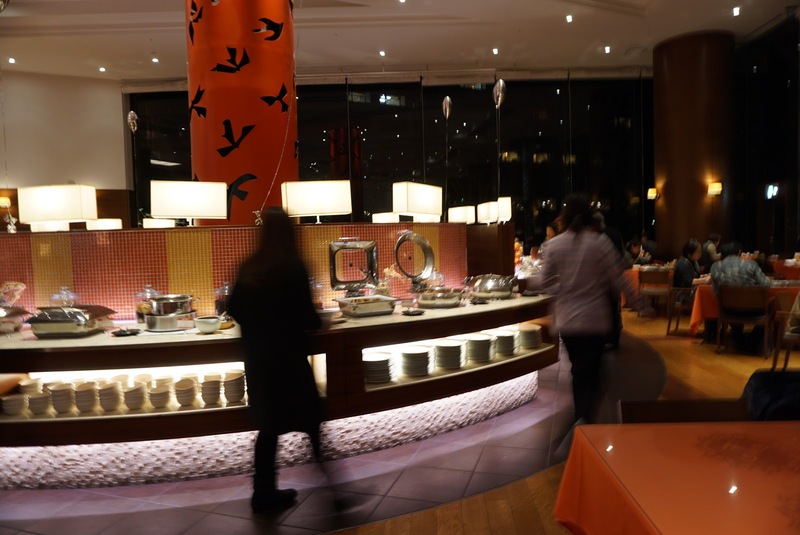 The restaurant is smaller in size but the variety of food is generally similar to that served in the buffet hall. Food are fresh and delicious. 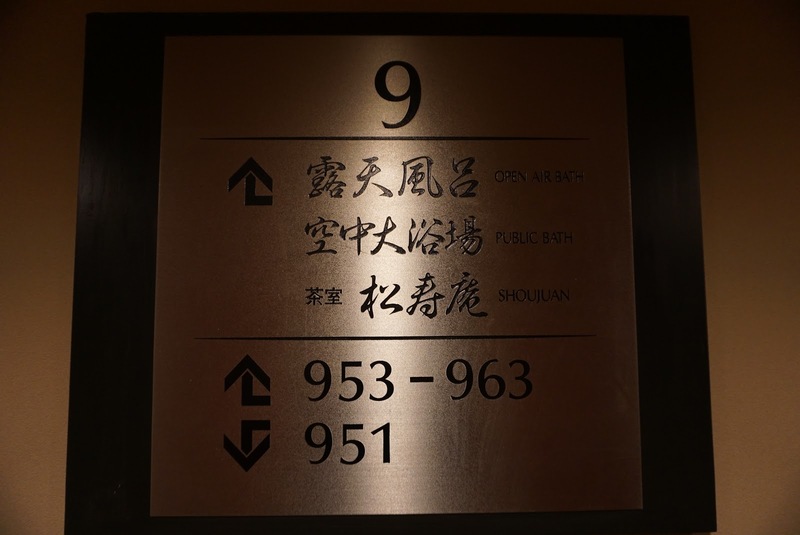 The gender separated onsen in the hotel is located on 9th floor. The onsen water come from the nearby hot spring around Lake Toya and has a mixture of Chloride Spring, Sulfate Spring and Hydrogen Carbonate Spring, effective for skin conditioning and cuts and burns. 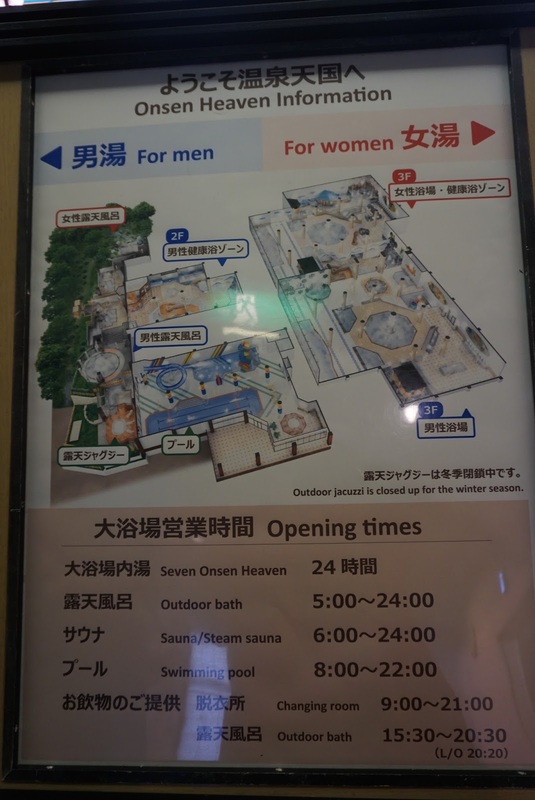 There are a total of 5 onsen pools, 2 of which are outdoor. All the onsen pools faces Lake Toya. 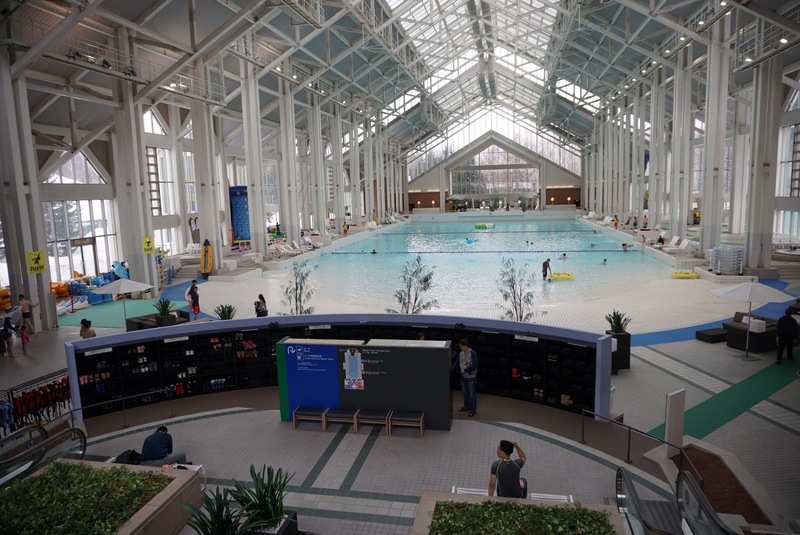 The largest onsen pool is indoors. The outdoor onsen pools are placed in a balcony of some sort, which don’t really feel outdoor to me. 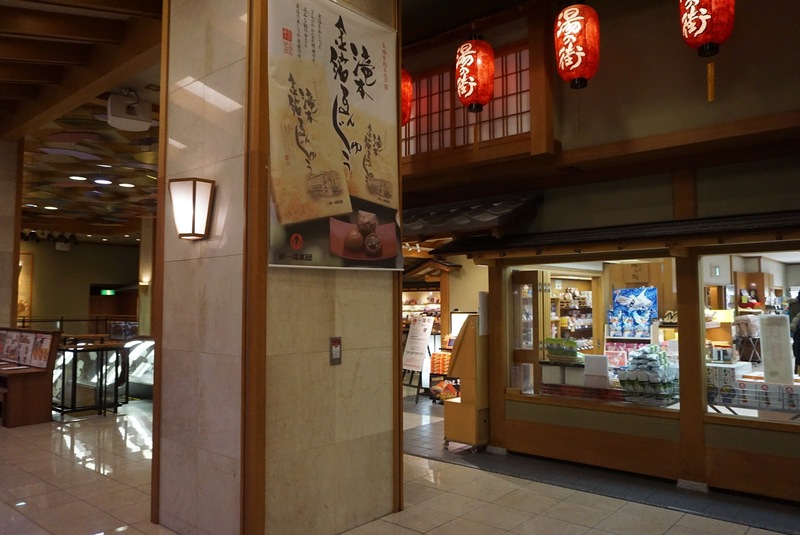 There is a souvenir shop in Kohan Tei on 1st floor, next to the reception. 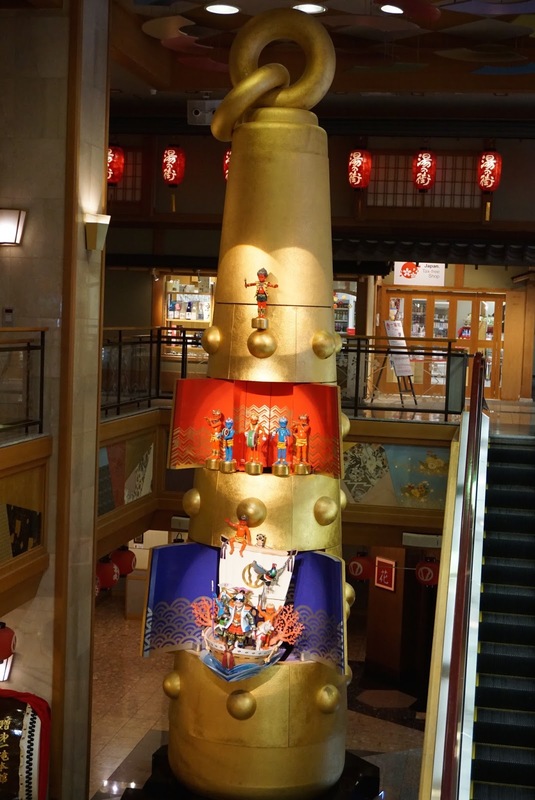 There is a good selection of souvenirs from the local area, but mainly from all around Hokkaido, which can be gotten from elsewhere. Service was more negative than positive. 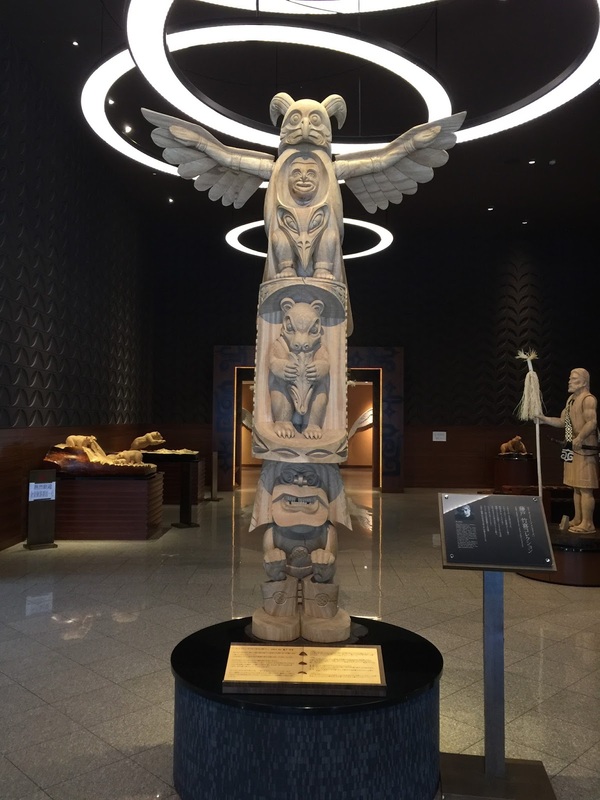 As I arrived earlier than the check-in timing, the staff at the reception appeared irritated when seeing me at the reception trying to check if I can check-in. Without a smile and without checking, she stuck to the policy of checking-in at 2pm. When I checked with her regarding the nearby sights, she merely said she don’t know. When asked if we can leave our luggage at the reception until we come back later, the staff at the reception told us to bring our luggage to the end of the counter and just leave it there. No one attempted to bring our luggage and store it securely. When returning some hours later, our luggage is still outside the reception counter. There is no attempt to help guests secure their luggage by the hotel. There are staffs knocking on our door at around 6pm asking to set up the futons for us. As we were preparing to head out for dinner, we told the staff to give us 5 mins. Before we leave the room, we approached the staff to get him to help us set up the futons in our room. We got the signal from the staff that he will set it up later. However when we returned to our room later at night, our room was not ready for sleeping. Futons were not set up and everything was in its “day time mode”. We called the reception, somehow the staff at the other end of the line did not seem to understand us. My friend and I headed to the reception and told the staff our situation. The staff left the reception and set up the futons for us, which was supposed to be set up some 3 hours ago. 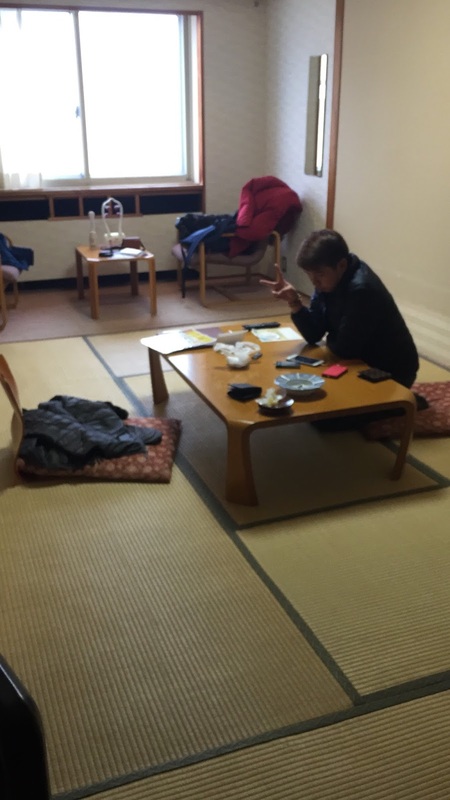 The next day after returning from our travels in Toyako Onsen, we were shocked that our futons were not put away, as though no one has came to make up our room. 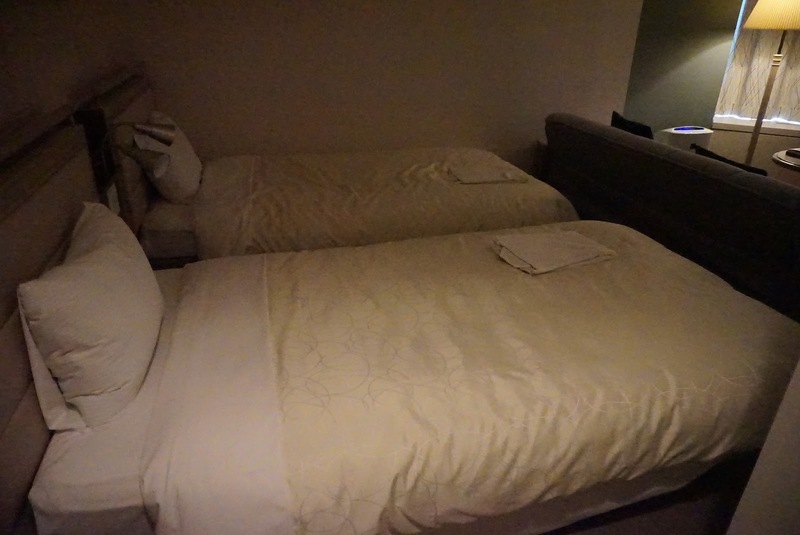 The futon was left at the room for the rest of our stay, signalling that no one bother to clean up our room. The worst service I have gotten in Kohan Tei is the staff from China at the buffet hall. We were not made known that the meal coupons will be replaced the next day (the staff at the reception did not brief us about it), we surrendered one meal coupon. The staff from China shouted at us and told us there should be 2. When showed her both coupon and explained our assumptions, she shouted at us again and told us the coupons will be replaced the next day and told me to check my facts with the reception. Before we were granted entry into the buffet hall, she shouted at us again and told us to take off our shoes before entering. 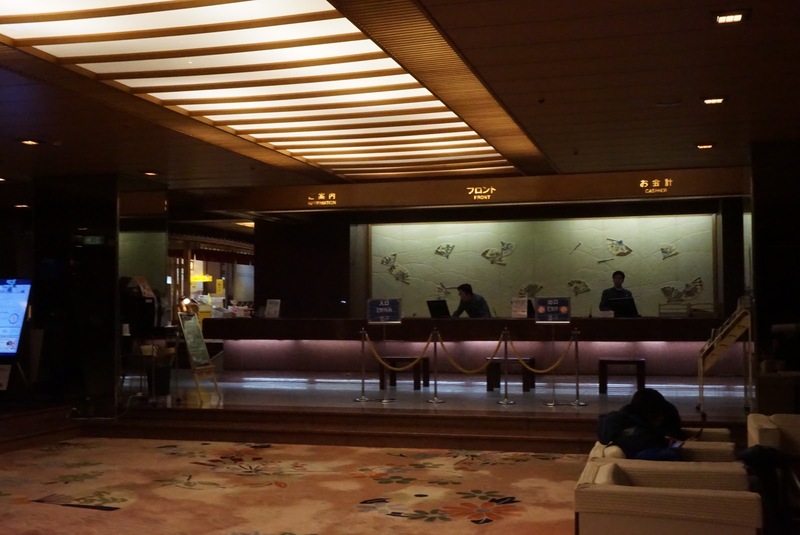 I raised this issue with the reception and wanted to speak to the duty manager of the hotel, but was told that there are no duty managers in the hotel. Instead she got the restaurant manager to speak to me, with another staff from China acting as translator. Before the manager came, the staff from China questioned me in a hostile manner why do I want to complain, but her attitude changed when the duty manager came. The only good service I have gotten in the hotel are from the restaurant manager. When made known what had happened, she apologised profusely and instructed the reception to change the place we would dine for the rest of our stay immediately. The staff at the restaurant in B1 was amazing and welcoming. They were very friendly and greeted us as well as bid us farewell whenever we enter or leave the restaurant. The service in this restaurant is heaven and earth from that in the buffet hall. 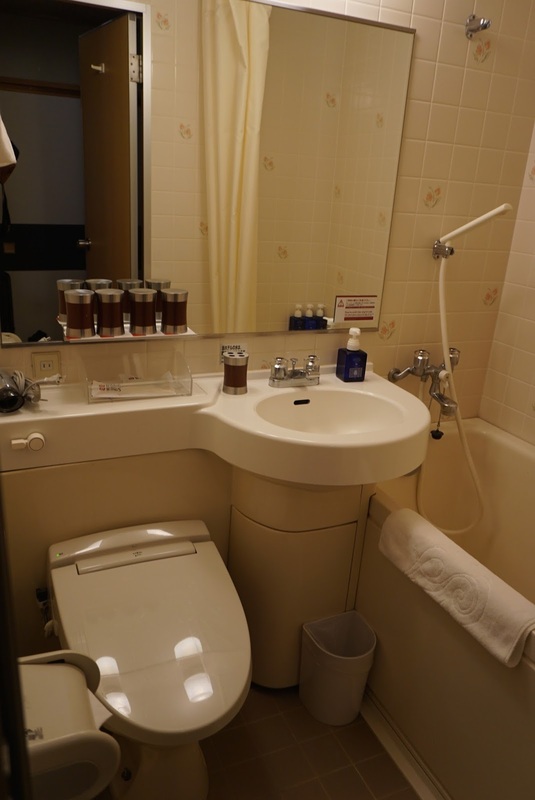 The rooms in Kohan Tei are aging and the toilet is very dated and small. 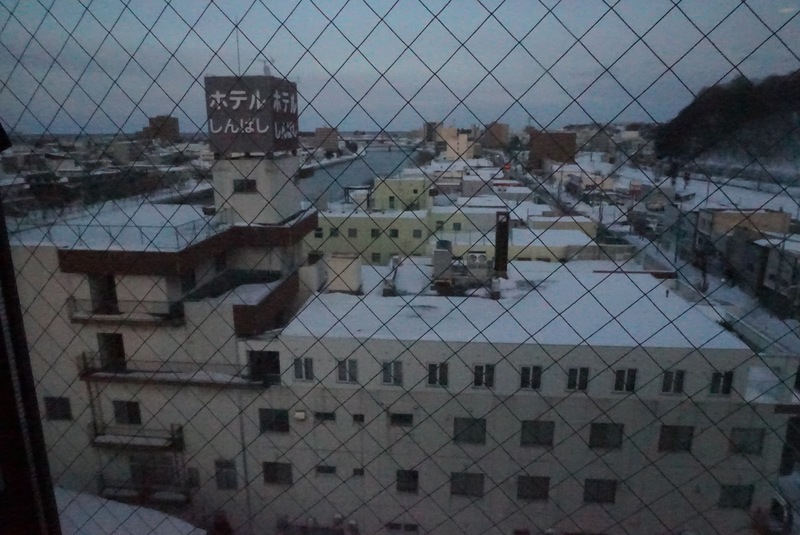 The sleep quality on the futon laden tatami floor is good, and the views from the room is excellent. 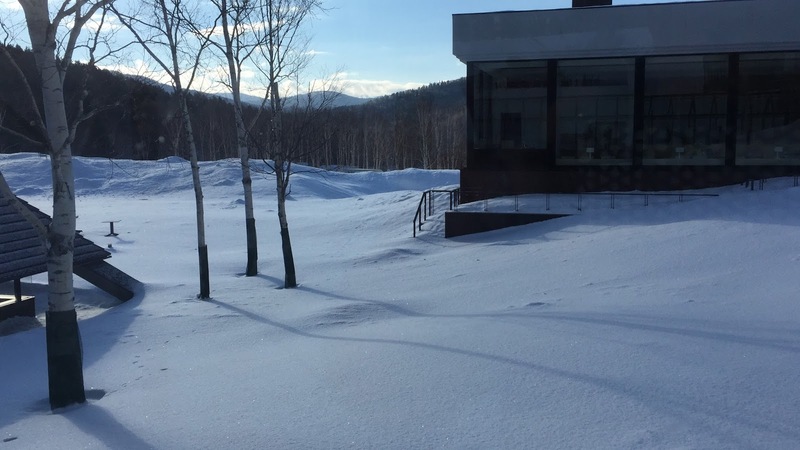 Other than that the hotel is the worst I have been in Hokkaido. 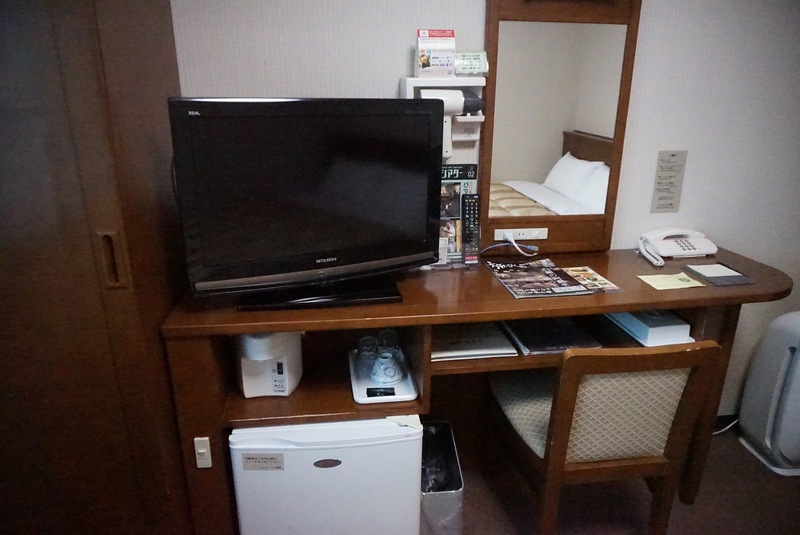 The service is horrid except for a handful of staffs, the futon were not set up at night and not kept away in the day. The onsen is rather small, despite boasting to have a roof top outdoor onsen, the outdoor onsens for males are merely placed in a balcony. I would avoid this hotel at all cost. 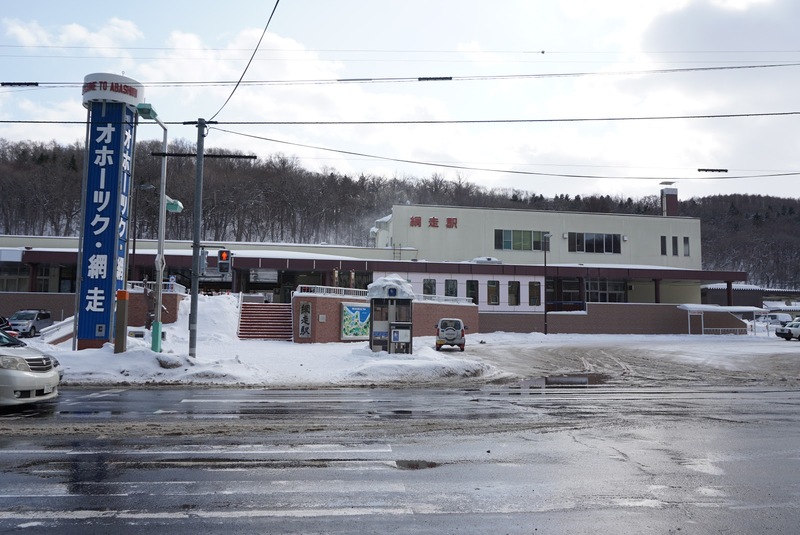 Dai-ichi Takamotokan is about 1 hour bus ride from New Chitose Airport and about 20 mins bus ride from Noboribetsu JR Station. 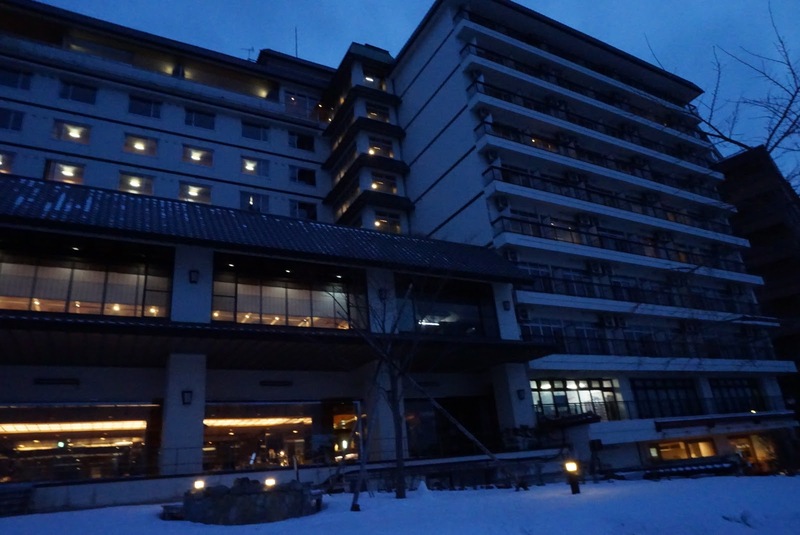 The hotel located at the end of Gokuraku Shopping Street in Noboribetsu Onsen. 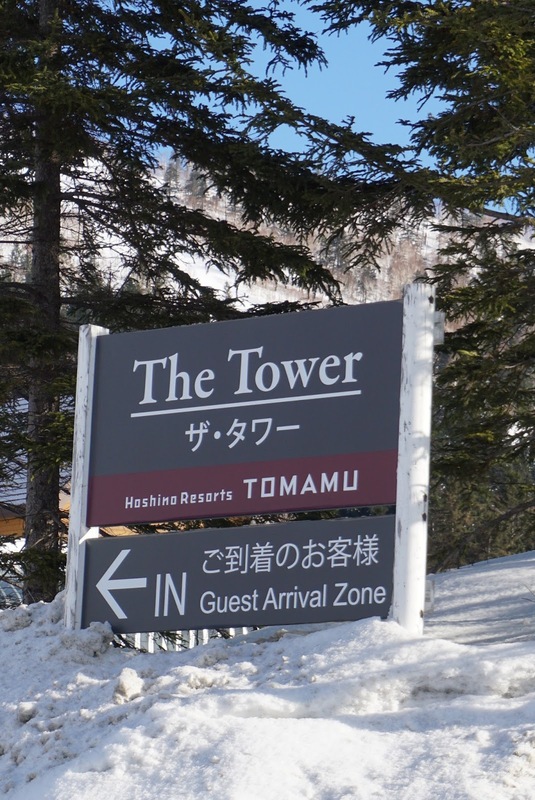 It is the closest hotel in town to Jigokudani or Hell Valley sitting right at its entrance. Noboribetse Onsen is a very small town, walking from on end to the other along Gokuraku Shopping Street takes mere minutes. 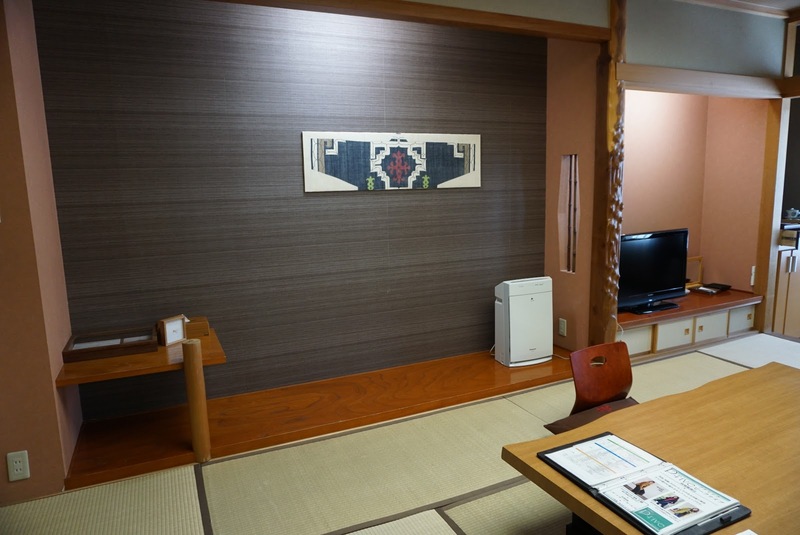 We checked into the 27㎡ Japanese style room in Dai-ichi Takamotokan in its west wing. 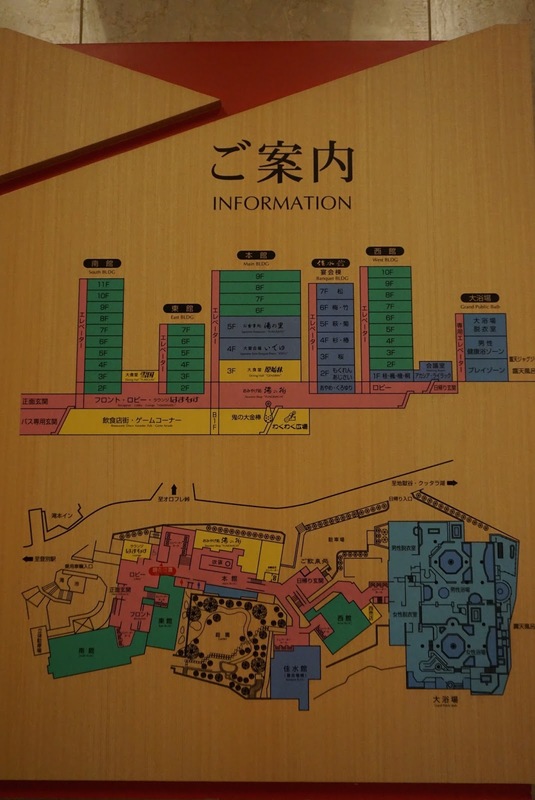 The hotel is a large hotel with several wings, west wing is the building closest to the onsen in the hotel. 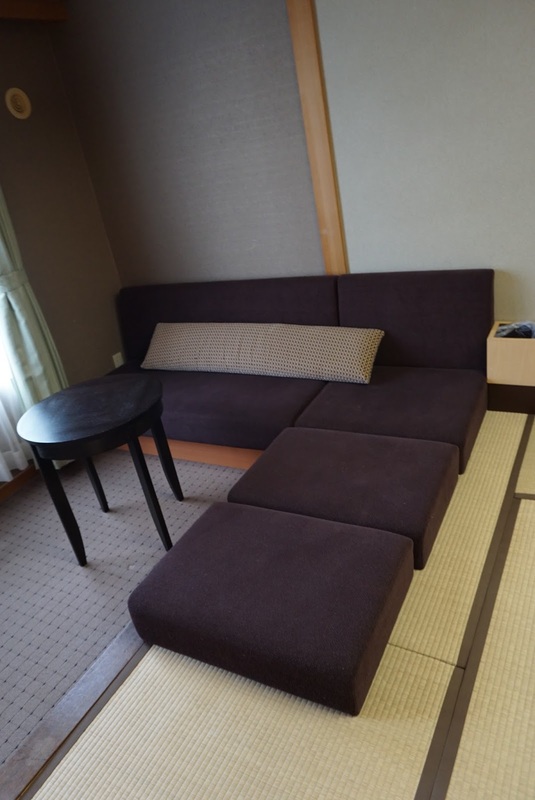 As with most Japanese style rooms in other hotels, there is a small porch area when we entered the room. This is where we take off our shoes. 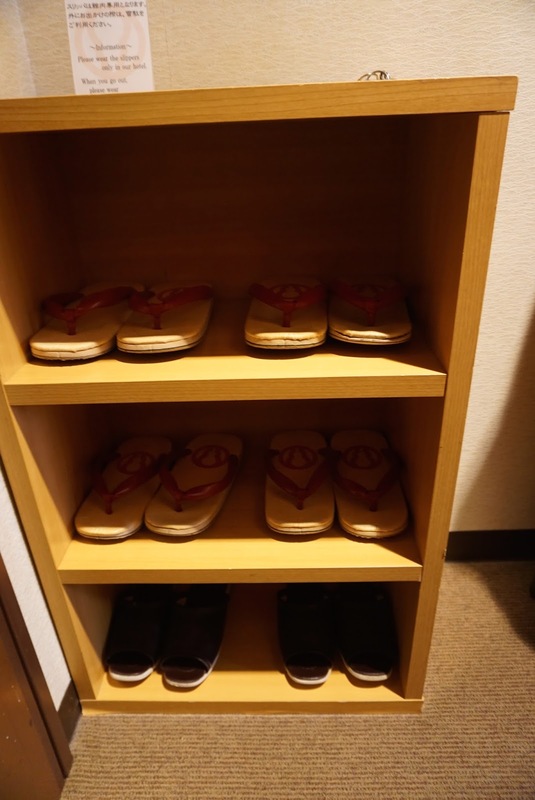 There is a 3 tiered shoe rack stocked with sandals that we used while in the hotel grounds when we were in our yukatas. The bathroom is on the right side of the porch. 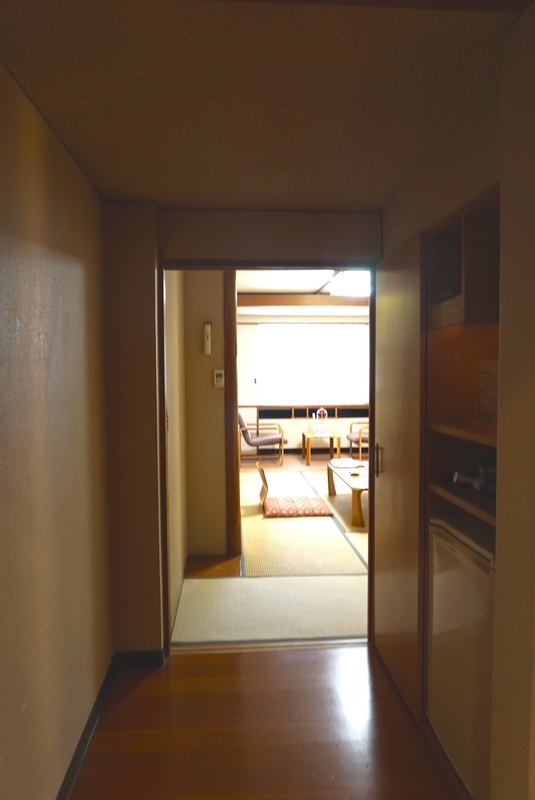 Further into the porch, before the Japanese style doors, is where the mini bar and wardrobe is located. 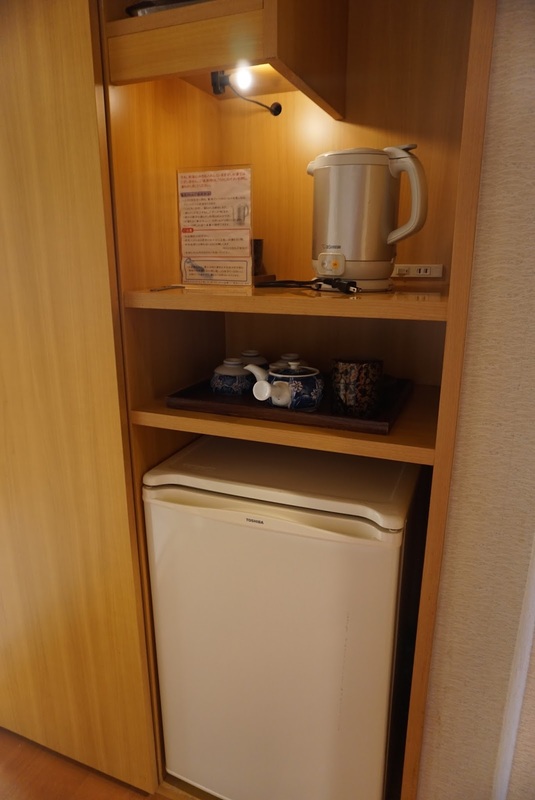 Other than the mini fridge, the room is stocked with kettle and green tea at the mini bar area. 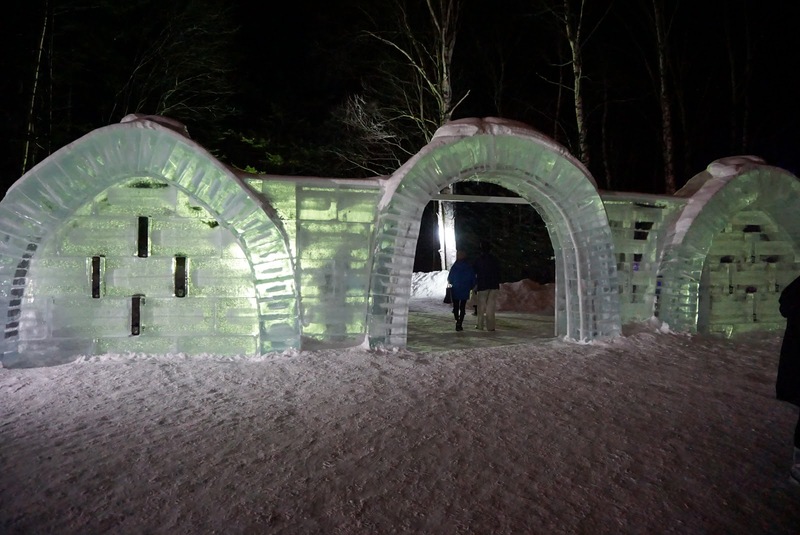 The wardrobe is rather small, which can only hold 4 pieces of winter jackets. 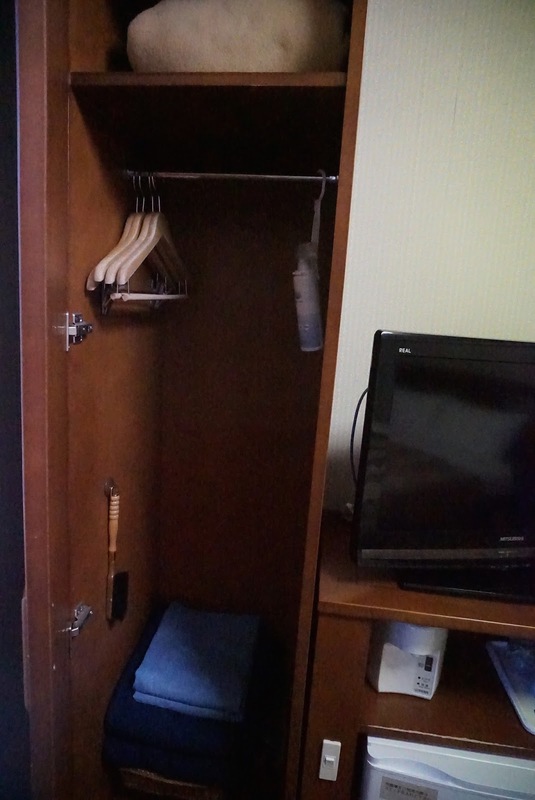 The in-room safe is found in at the bottom rack of the wardrobe. Passing the inner Japanese door inside the room, we entered the sleeping area. 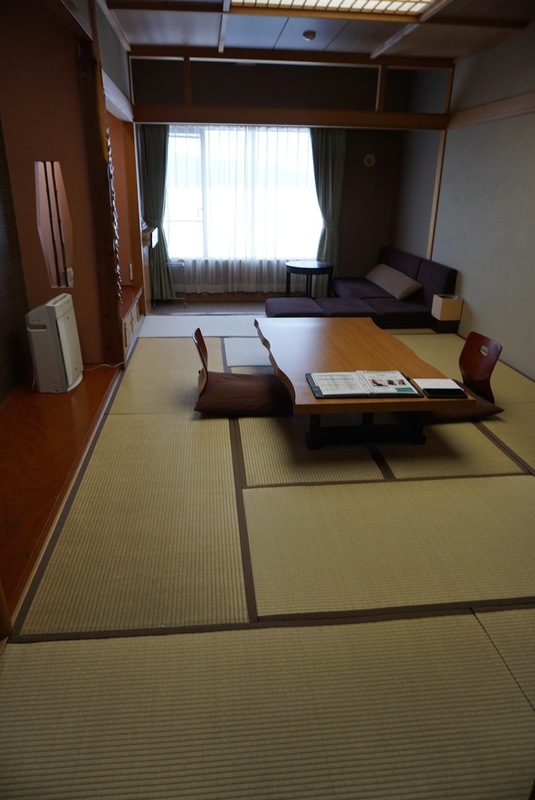 The tatami floor is furnished with a short table and a couple of chairs in the middle of the room. 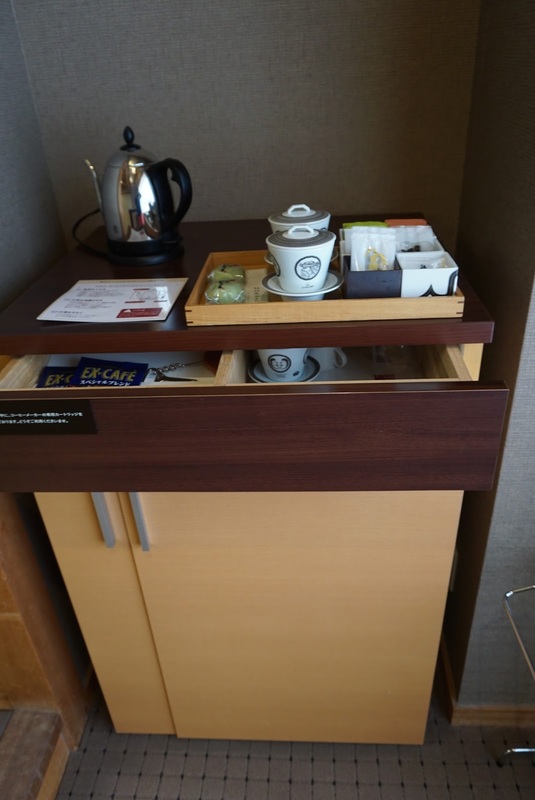 At the side, placed by the wall is a small cabinet which guests can use to store some small items on one side and a 2-tier TV console with a LED TV placed on top facing the small table. 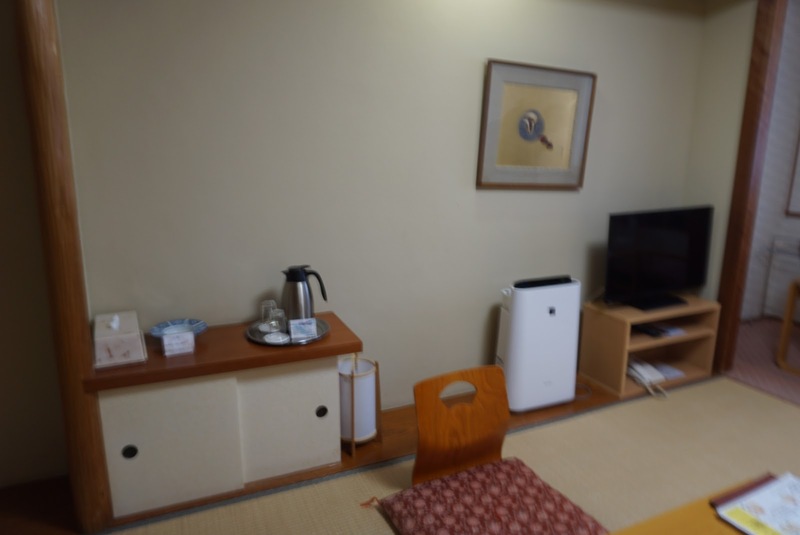 The Japanese style room feels spacious due to the use of futons instead of beddings. 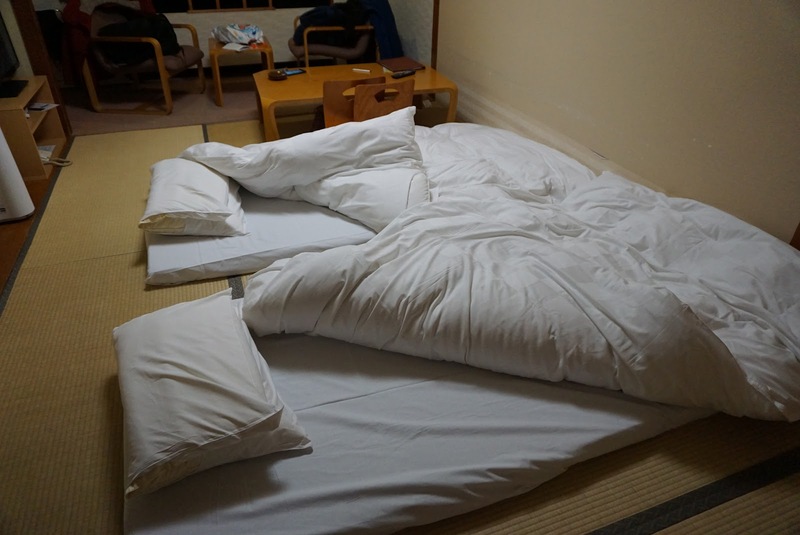 In the evening, staffs of the hotel would come into the room (while we were out for dinner) to set up the futons, converting the space for sleeping. The small table is being shifted to near the lounging area to create the space. The futons will be kept away in the day. 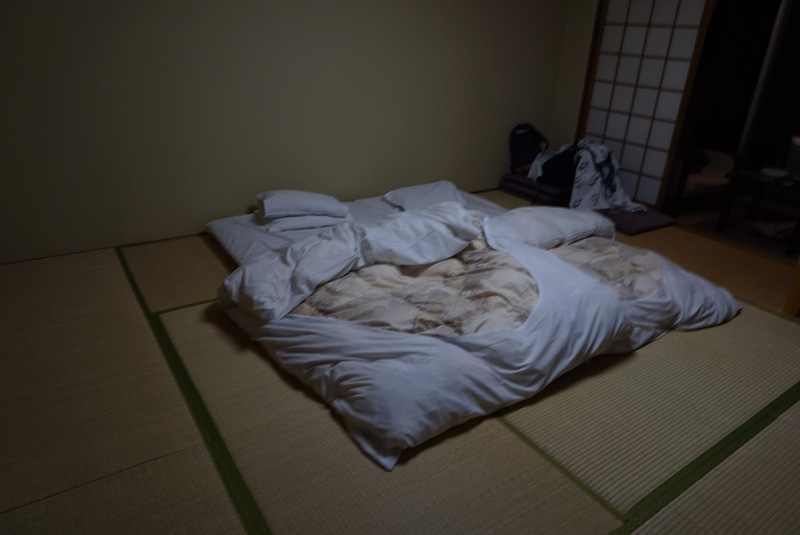 The sleep quality on the futon over the tatami floor is excellent, I got great rest at night and woke up feeling refreshed. However I do find the pillow a tad too soft for my liking and had to request for additional pillows. The lounging area is a small area at the far end of the room, just by the window, with 2 armchairs and a coffee table. Dai-ichi Takamotokan thoughfully placed a neck and head massager here for guests to relive any aches. The lounging area is a great place to sit by with a cup of hot green tea in the cold winter especially at night when the futons were set up. 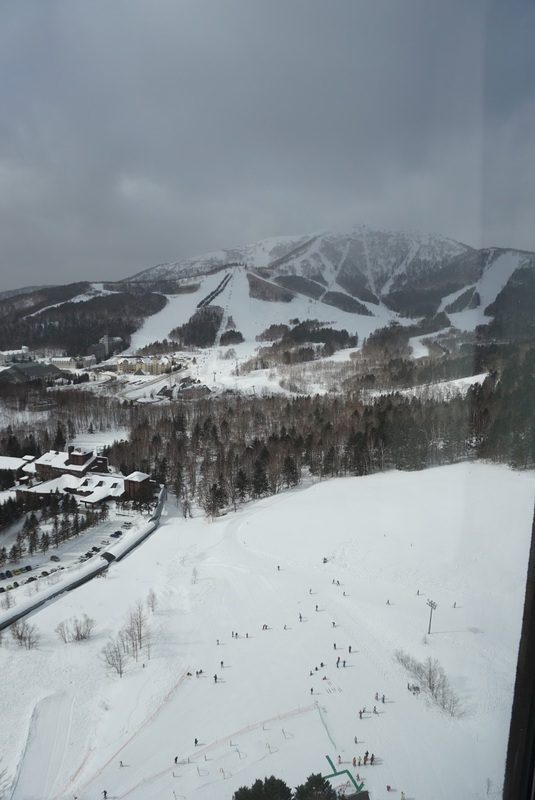 The view of Noboribetsu overlooking the mountains is beautiful. 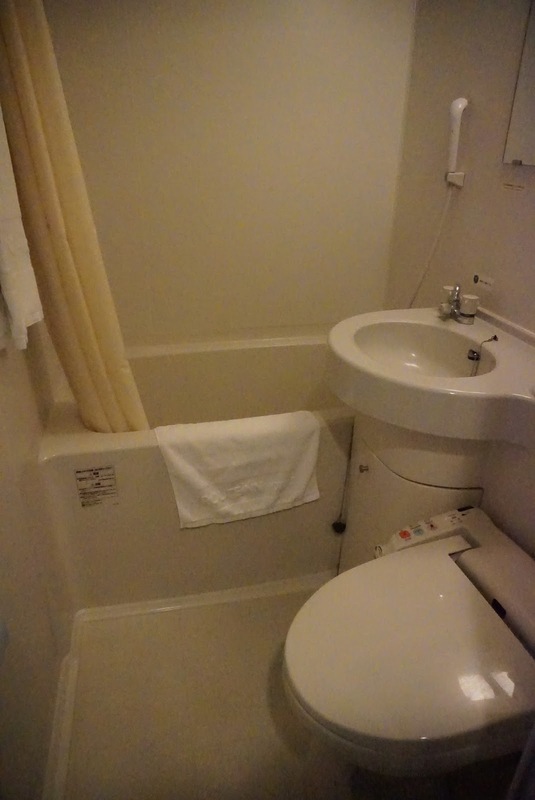 As with most Japanese hotel, the bathroom is small but functional. It has all the essentials that is needed for one’s bathing. 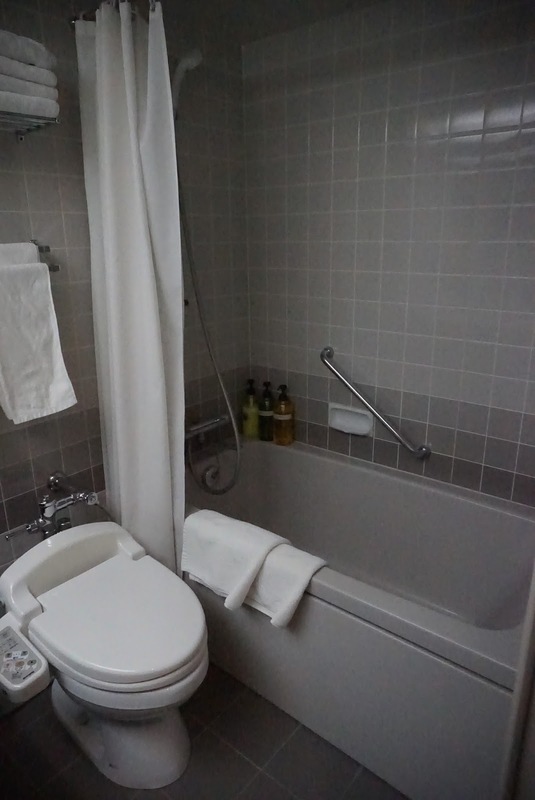 The toilet bowl with washlet, sink and a bathtub is tightly fitted into the bathroom. Despite the small size, there are still space for one to move around in the bathroom. Showering has to be done in the bathtub as there are no separate walk-in showers. 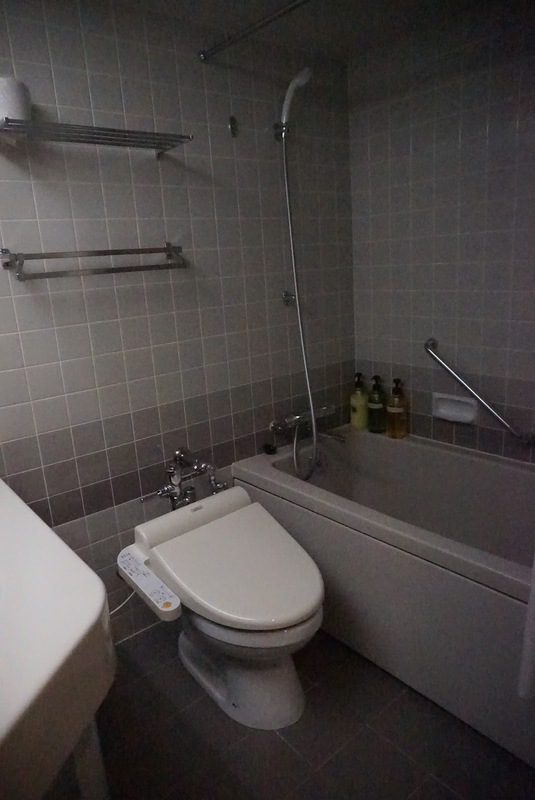 Dai-ichi Takamotokan provides the essential bathing amenities for the convenience of guests. 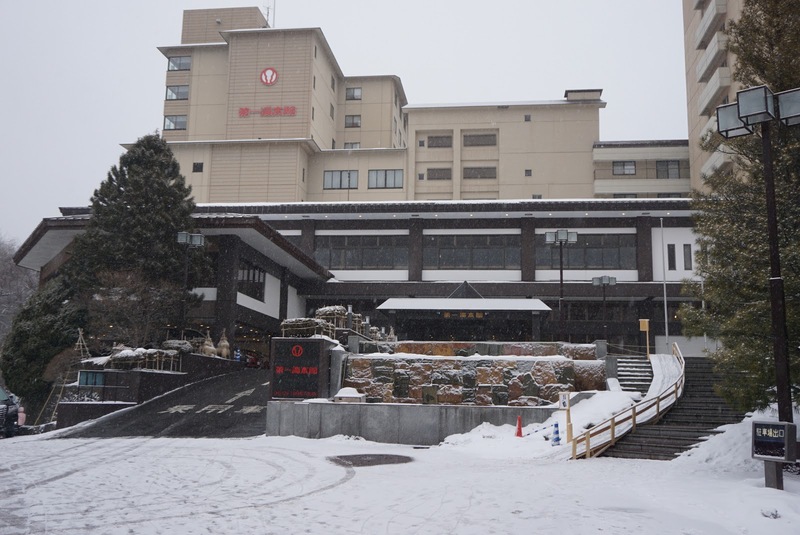 Dai-ichi Takamotokan has one of the largest onsen in Noboribetsu Onsen. 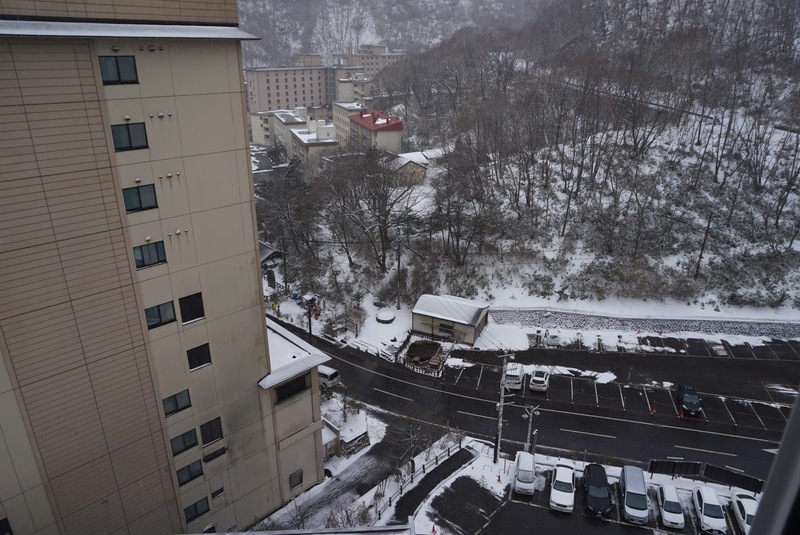 Due to its proximity to Hell Valley, the onsens here offers one of the best view in town. 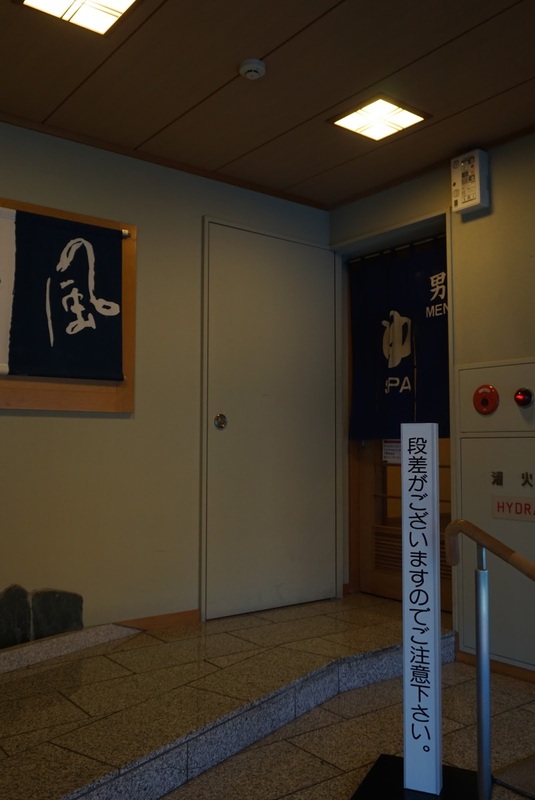 Dai-ichi Takamotokan has a total of 7 different type of onsens spread over more than 10 onsen baths. 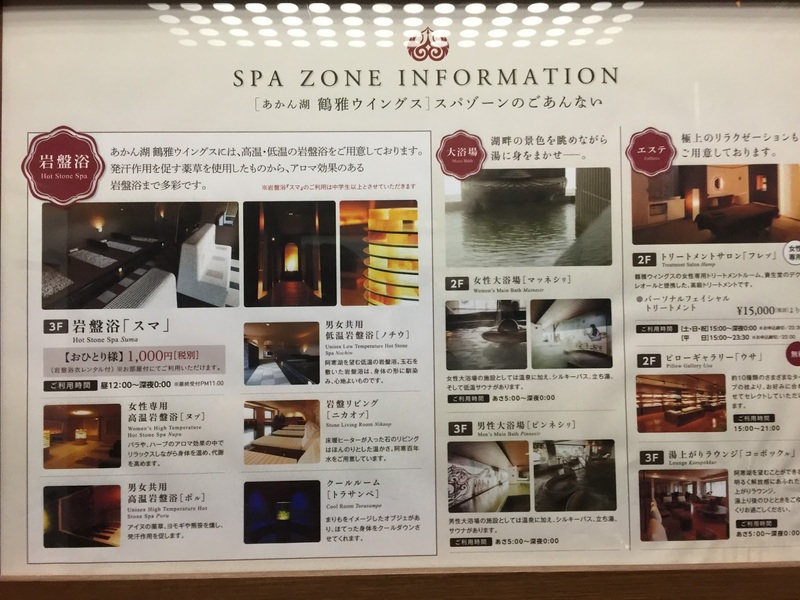 All 7 different onsens have different properties that promote good health and blood circulation. 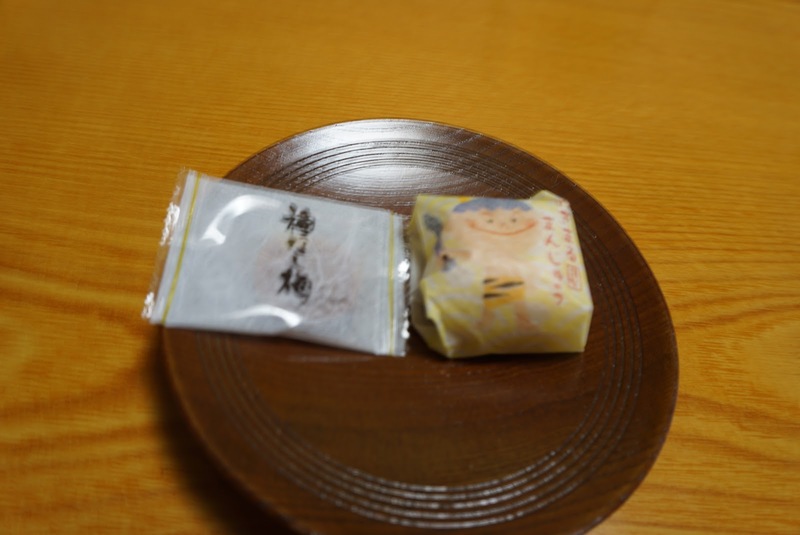 The onsen water mainly has sulphuric properties, a signature of Hell Valley. 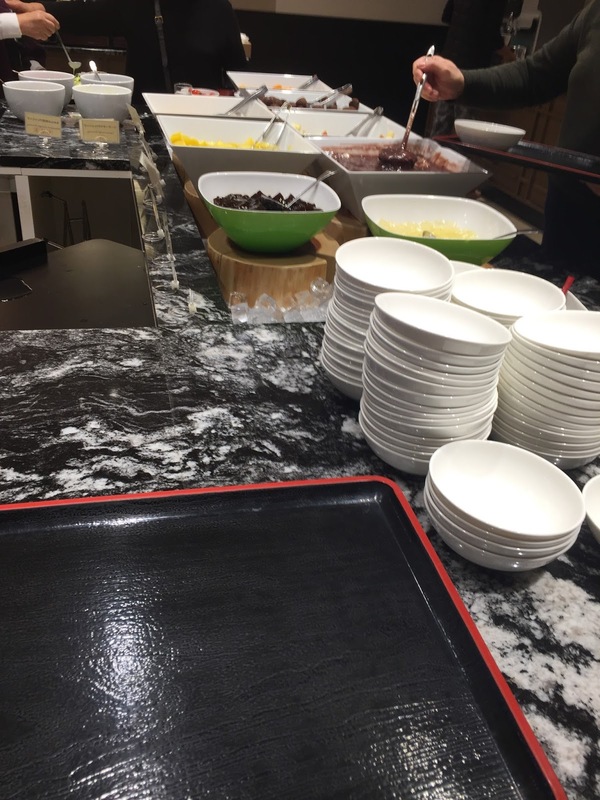 Breakfast is served in Gensirin Restaurant on level 3 of the main building. This dinning hall is large enough to cater to a large crowd. 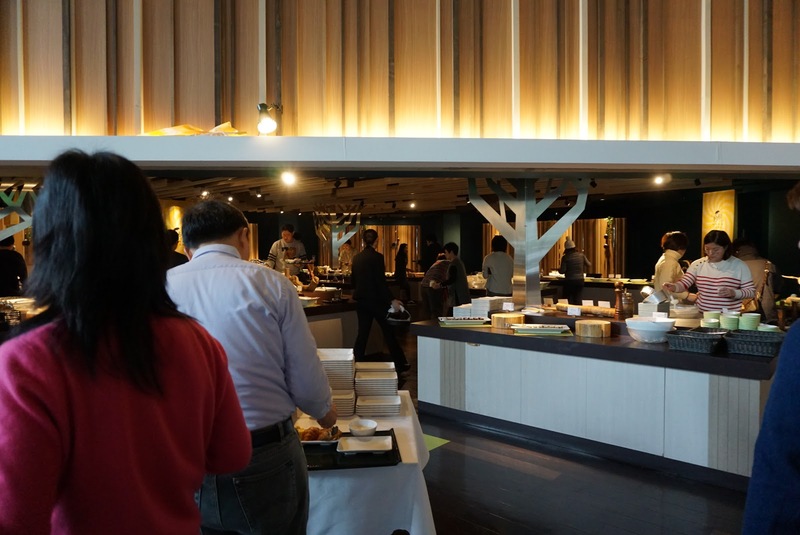 There is a good mix of Japanese and Western cuisine for breakfast. Despite having to cater for a large crowd, the quality of food is good. 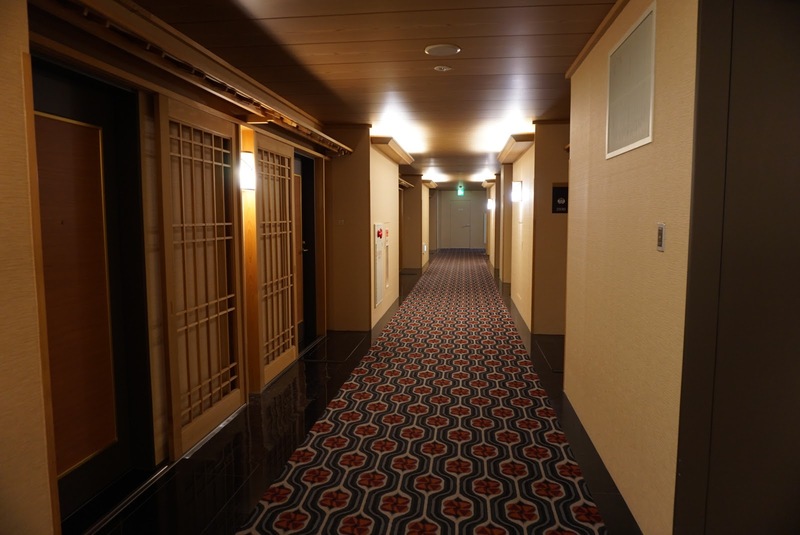 Our room rate includes dinner at Yunosato Restaurant located on the 5th floor in the main building. 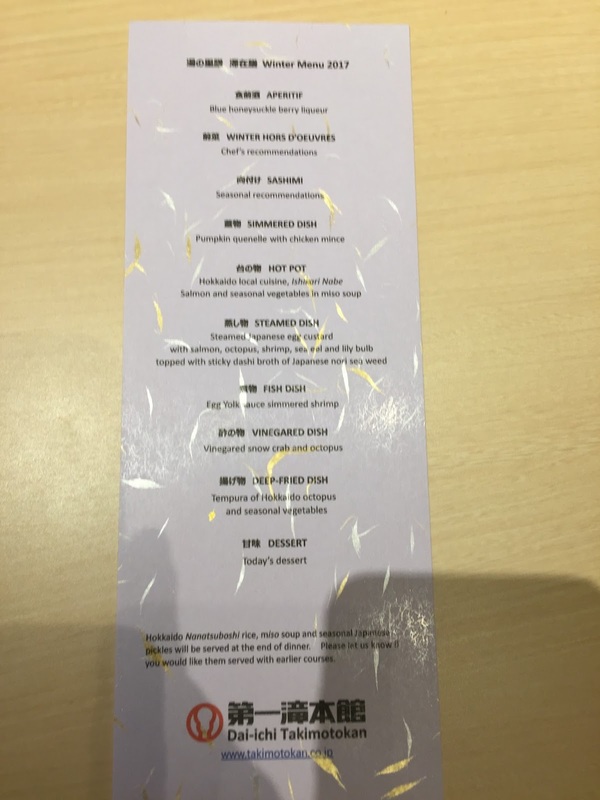 Each meal is 10 course and the menu varies from day to day. 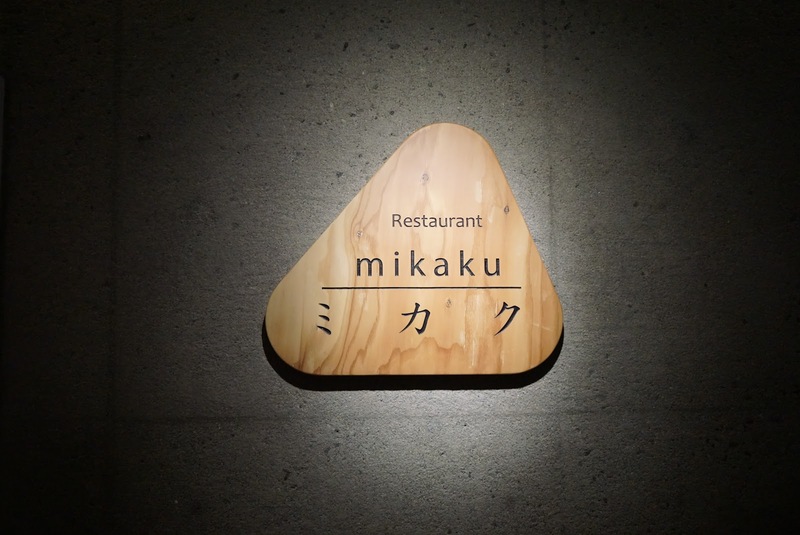 The food quality is excellent and the sashimi are very fresh. Guests are brought to a semi-private room to have their set dinner served to them course by course. 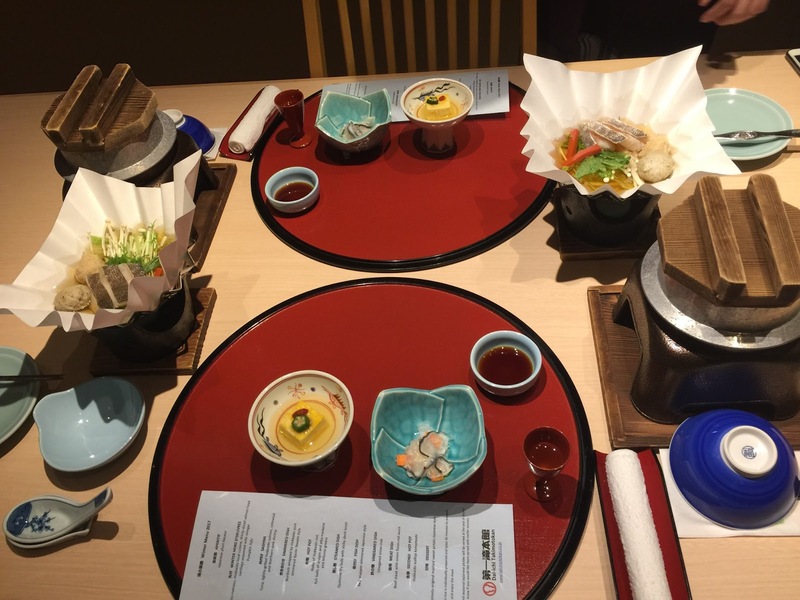 Dinning in Yunosato Restaurant makes one feel pampered. 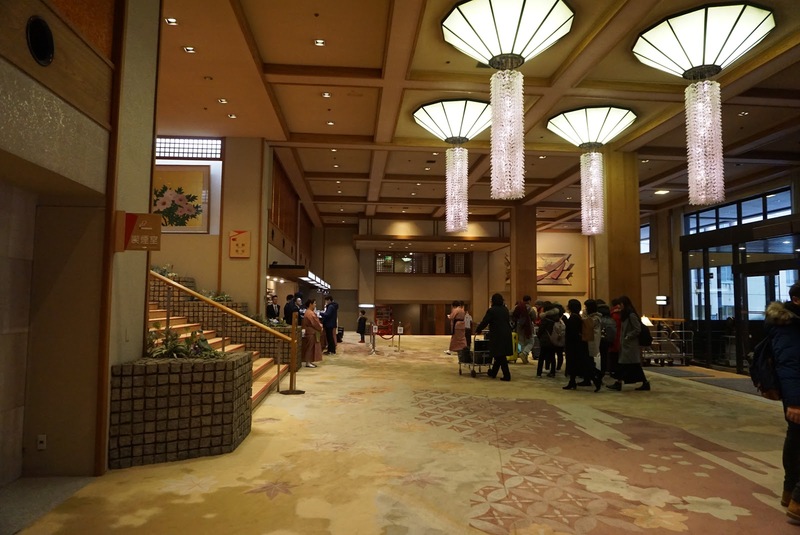 Dai-ichi Takamotokan is a huge and self contained hotel. 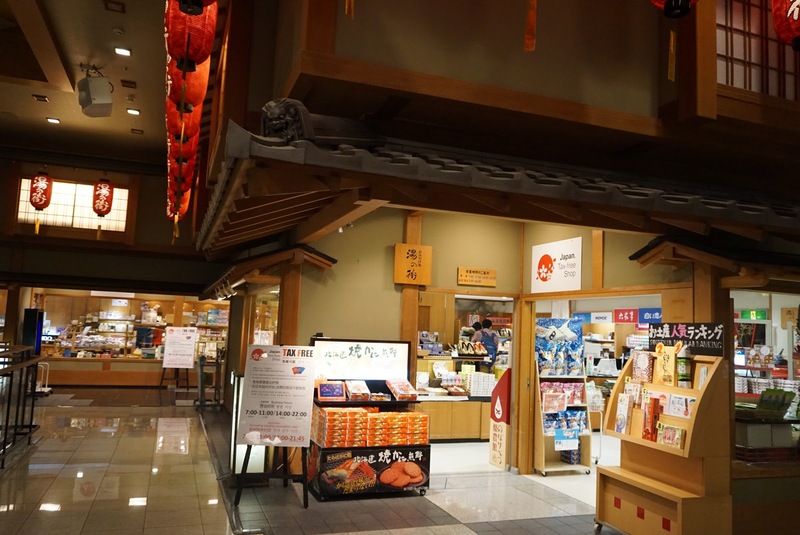 Other than having 3 restaurants, the hotel has a souvenir shop that sells a huge variety of local produce guests do not have to leave the hotel to get souvenirs. The shops here offers tax rebate to tourists. 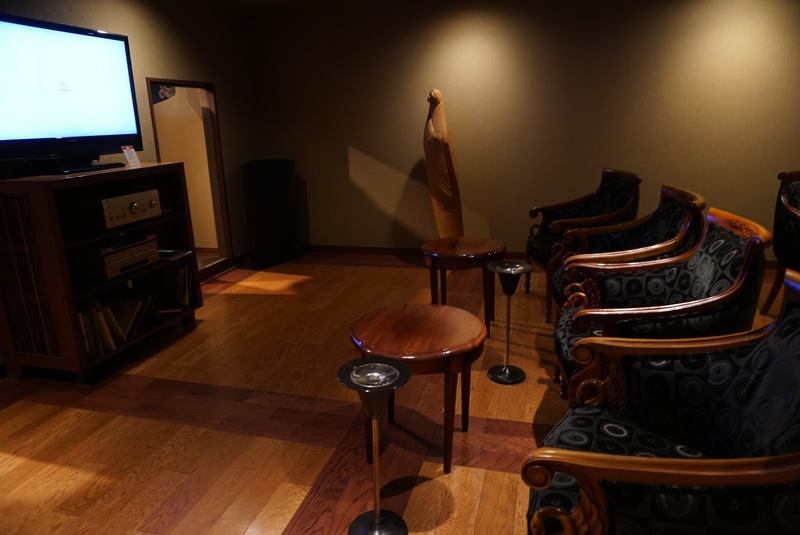 There is also a karaoke and a game centre for children to entertain at the basement. At certain timing of the day, a huge 2 storey statue will come to life with musics and dolls singing and dancing to entertain guests. 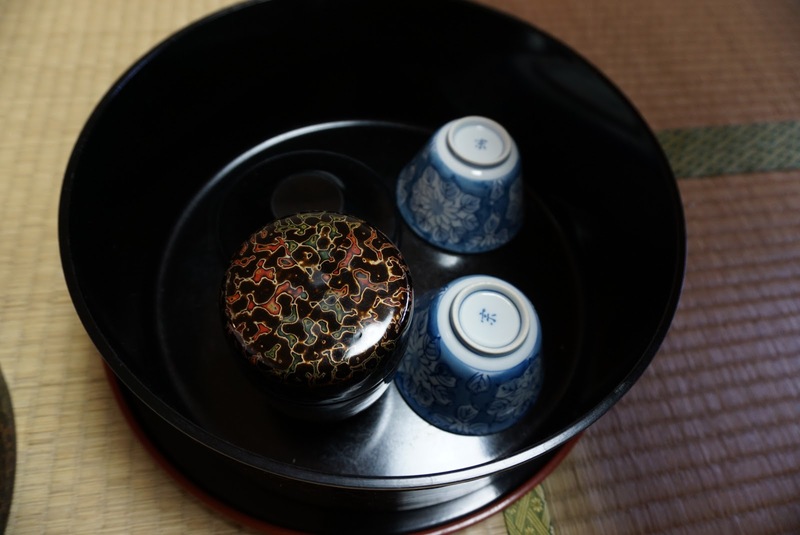 The service in Dai-ichi Takamotokan is nothing short of excellent. I was made to feel welcome the moment I stepped into the hotel. The staffs I met will always smile and greet me “Konichiwa”. Check-in was very efficient and the staff ensured that I do not have to wait longer than necessary to hand over the keys to my room. I was escorted by another staff to my room and along the way she gave me an orientation of the facilities around the hotel. Service at Yunosato is exemplary. I was warmly greeted every time I went there for dinner. The manager at the front desk saw me once and can remember which room I was from the next day. The staff serving me food introduced every dish that was being brought to me with a smile. At the end of the dinner each night, the staffs asked how the dinner was and even thanked me for having dinner there. Check-out was done in an efficient manner, without much delay. Before I depart the hotel, the staff checked if I needed help with my luggages. 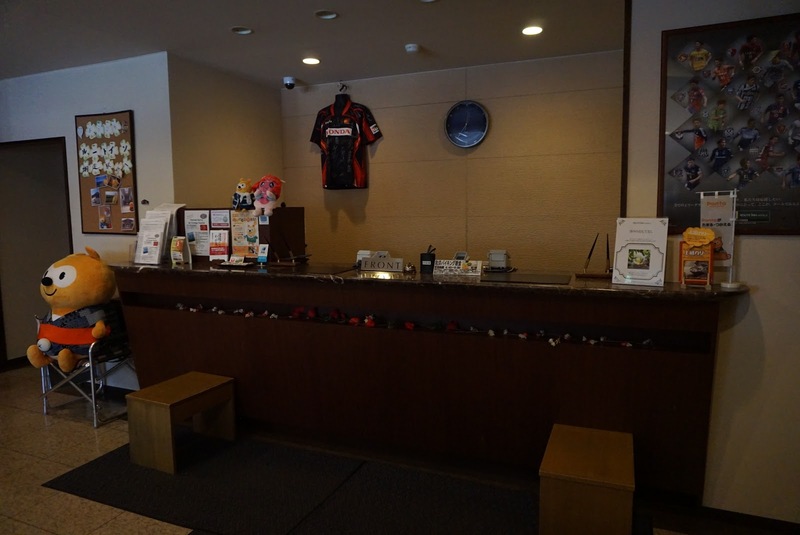 The staffs at the entrance of the hotel bowed and thanked me for staying with Dai-ichi Takamotokan. 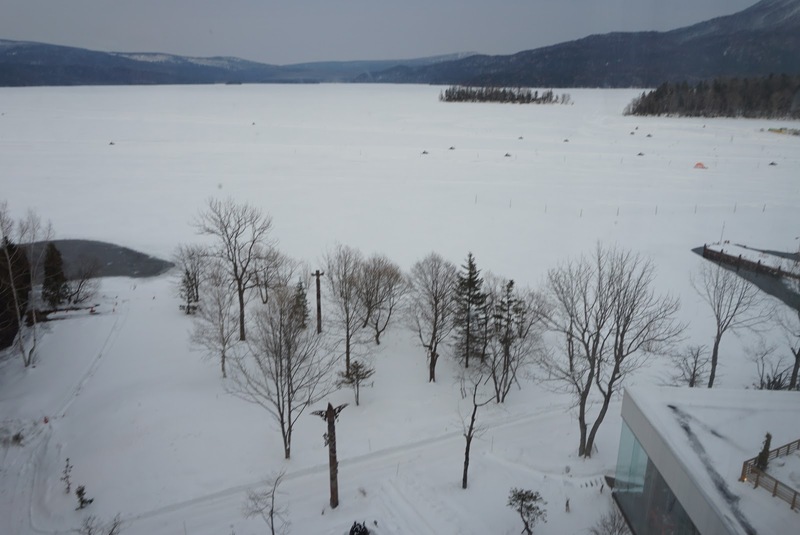 Lake Akan Tsuruga Wings Hotel is located at the west of Akanko Onsen Town, by the shore of Lake Akan. 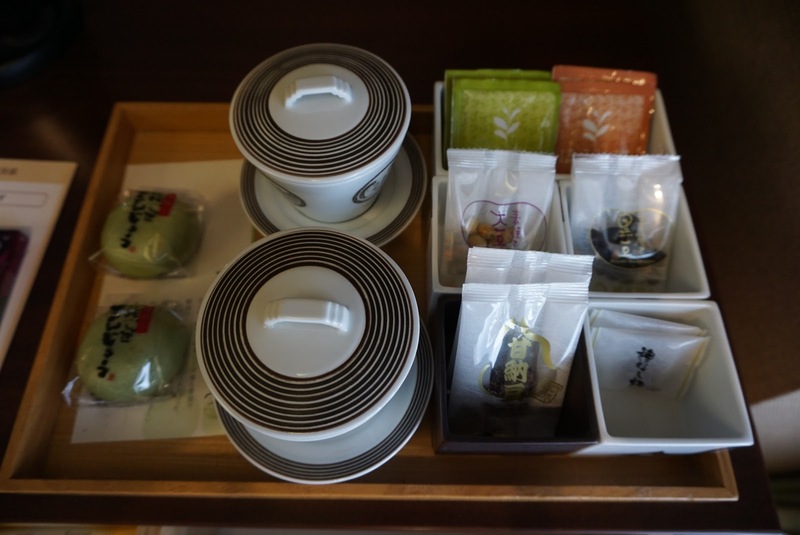 The hotel is conveniently located in Akanko Onsen with numerous souvenir shops right opposite the hotel. There are a couple of 24-hour convenient shops opposite the hotel. 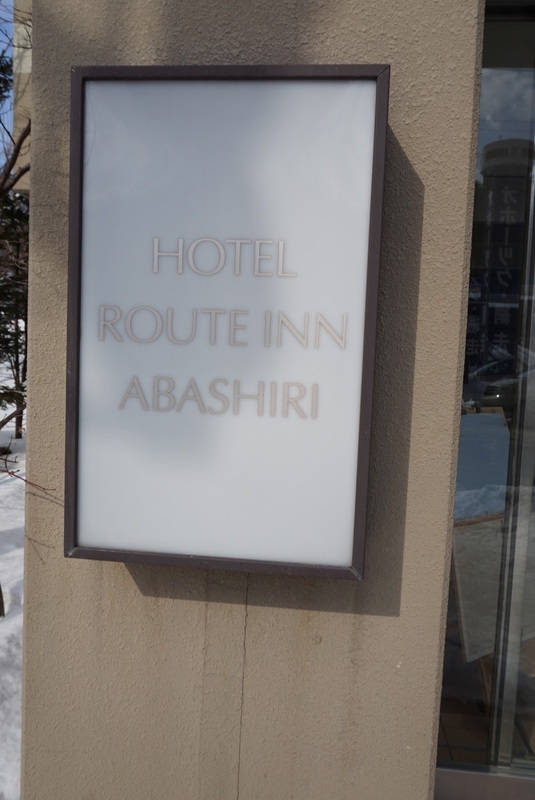 It would take one 5 mins to walk to Ainu Village and 7 mins to the Akan Tourist Information Centre from Lake Akan Tsuruga Wings Hotel. 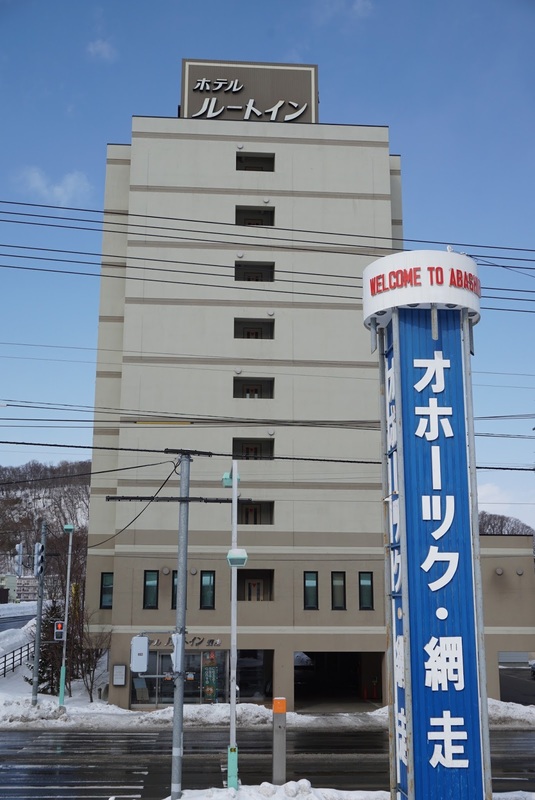 Akanko Bus Centre is 10 mins walk from the hotel. 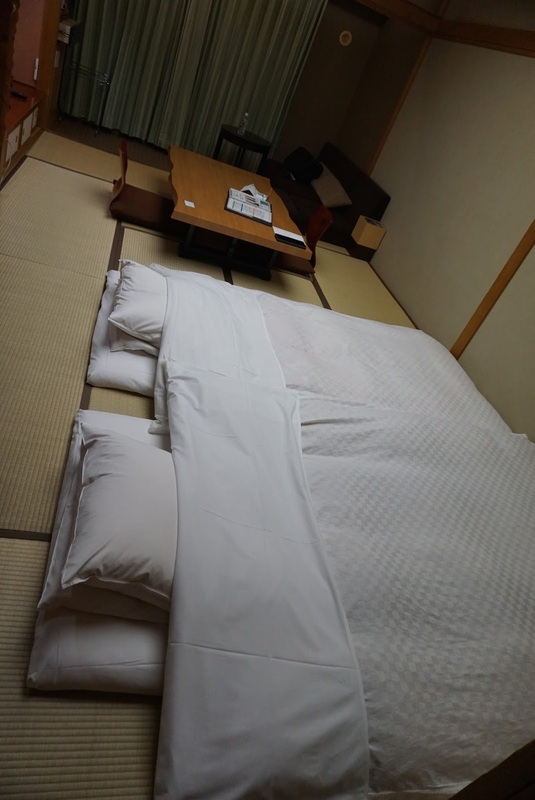 I checked into the Japanese style room in the hotel, instead of sleeping on a bed guests will sleep on the futon over the tatami floor. 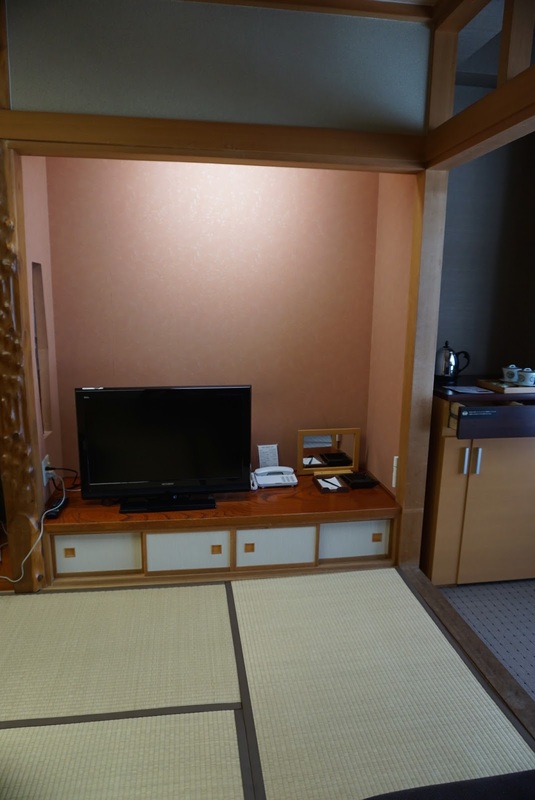 A small front porch greets guests when entering the 30㎡ Japanese style room. As the futon will be laid over the floor in the evening, guests are expected to remove their shoes before entering the room. To the left of the porch is a row of large cabinets where the bedding items are being stowed, and the toilet is to the right of the porch. 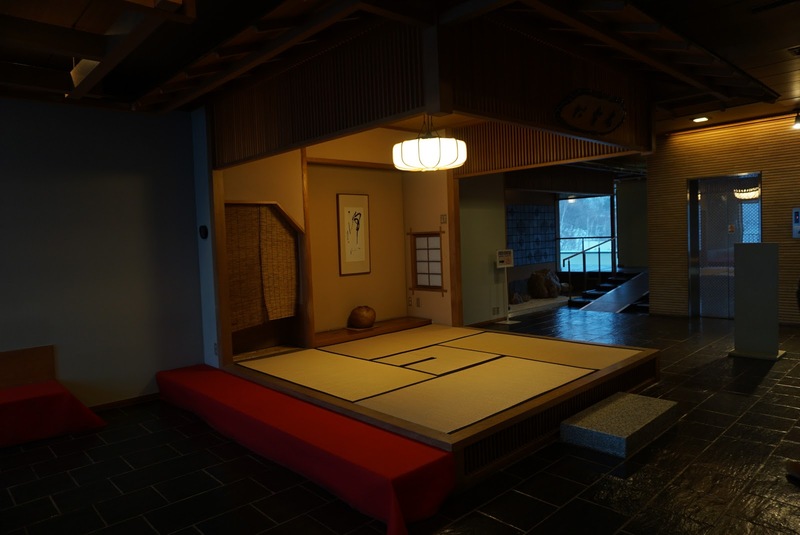 A Japanese style door separates the sleeping area from the porch. Passing through the Japanese style door from the porch, guests enters into the room sleeping area. 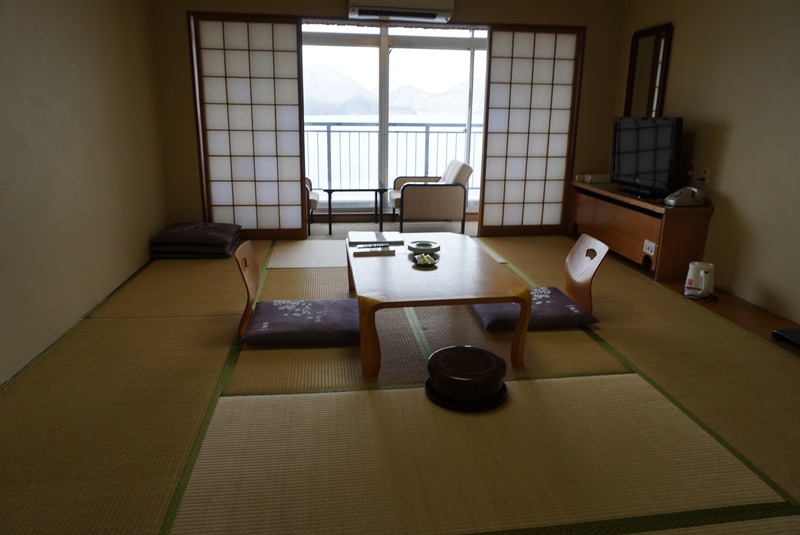 The light brown woven tatami floor looks very traditional and clean. 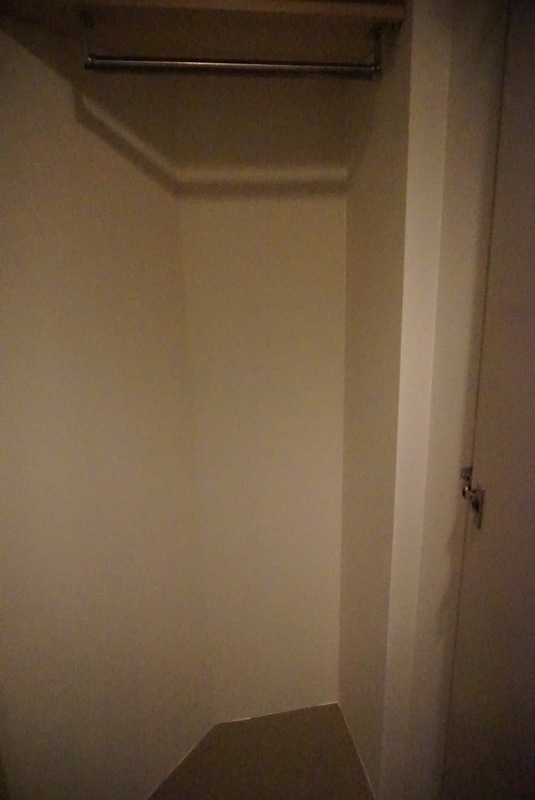 To the right from the Japanese style door, placed next to the wall is a built in wardrobe where one can hang some clothing. As the wardrobe is rather small, it is full when 2 winter jackets are being hung. 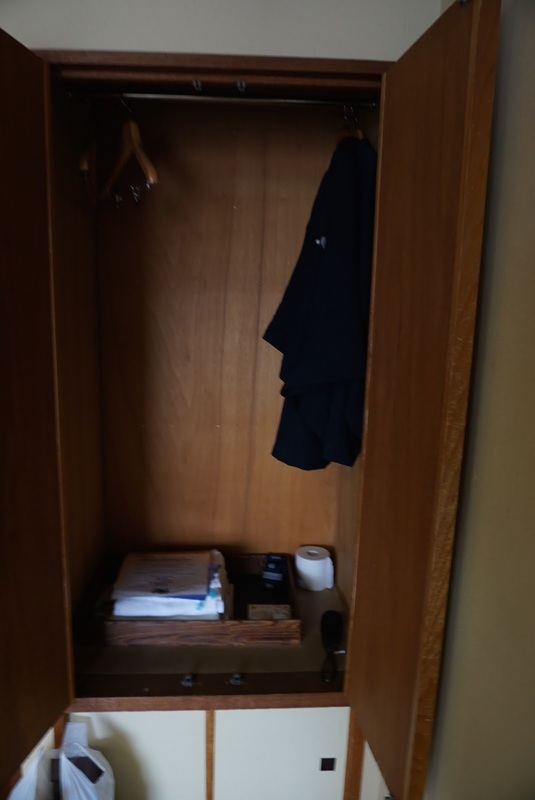 The in-room safe is tucked into the bottom of the wardrobe. Further into the room, a small knee height table and a couple of chairs are being placed in the middle of the room. Along the wall to the left of the room is where one can find a small table. There are a couple of power point outlet by the wall, making this table a great place to charge mobile phones. The TV console is further down the wall to the left of the room. In the day, only the table and the chairs will be in the room. 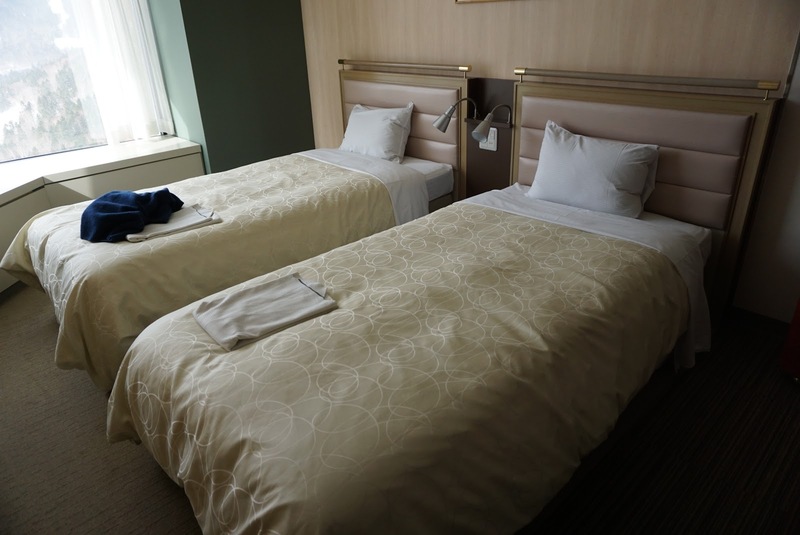 In the evening, hotel staffs will come into the room and set up the room for sleeping. 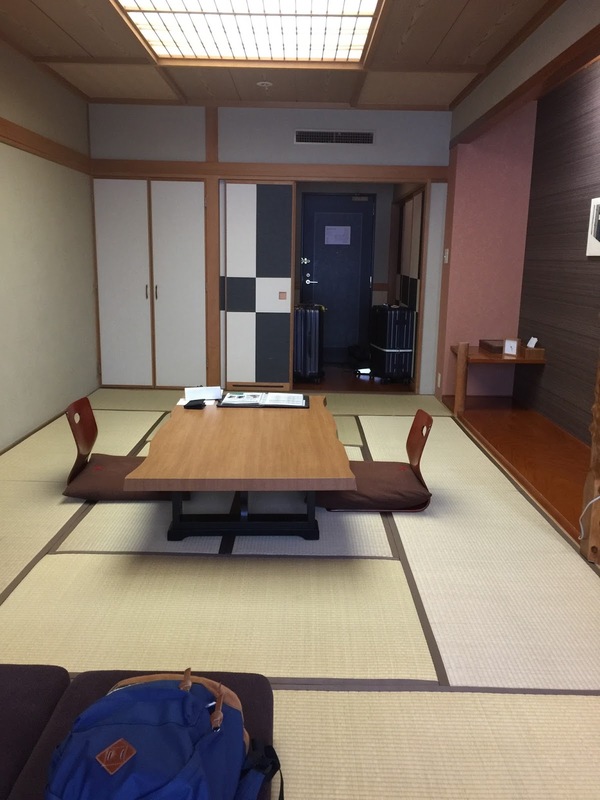 The small table will be shifted neatly to one side and the futons are being laid over the tatami floor. The sleep quality on the futons are excellent. I was able to get a great night sleep at night. The pillows are perfect to my liking as it is not too soft. Further into the room, next to the windows is a 3 seater L shaped couch. This is a great area to rest in the day and provided extra space to stow one’s day bag. There is a small coffee table placed in this area. 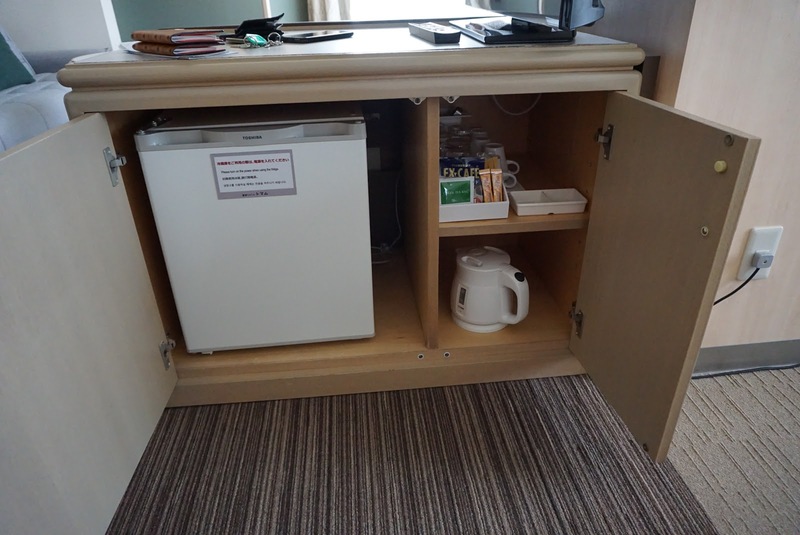 A cabinet, where the mini fridge is tucked, is located opposite the couch. This is where one will find the kettle and tea. The hotel placed some sweets on top of the cabinet. 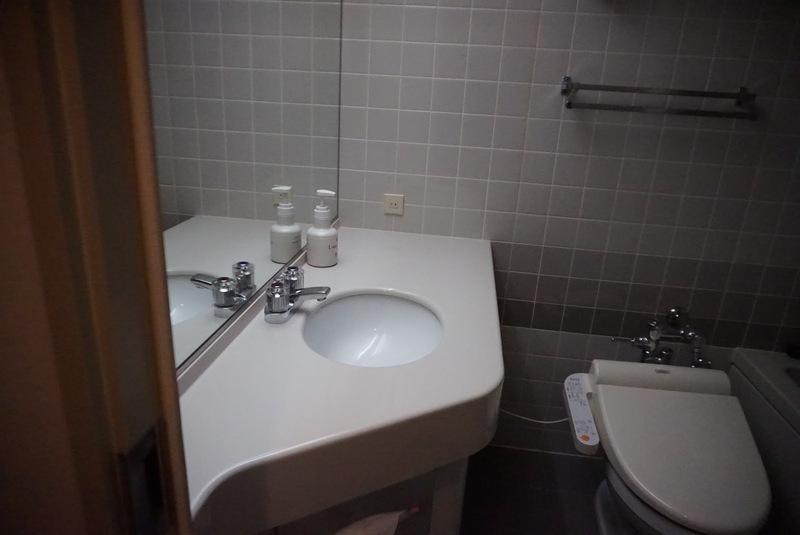 The bathroom inside the Japanese style room in Lake Akan Tsuruga Wings Hotel is rather small, much to the Japanese standard. From the entrance of the bathroom, at one glance, one can see the entire bathroom. Despite being small, it has all the essentials of a bathroom such as a toilet bowl with washout, a sink and a bathtub. There are no separate walk-in showers, guests would have to shower in the bathtub. 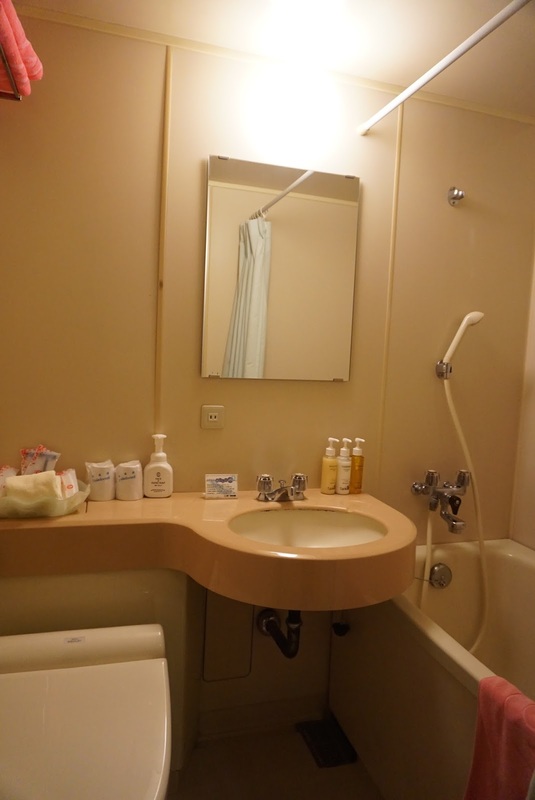 Lake Akan Tsuruga Wings Hotel stocked its bathroom well despite the size, it has all the standard bathing amenities that one would find in a 5-star hotel. 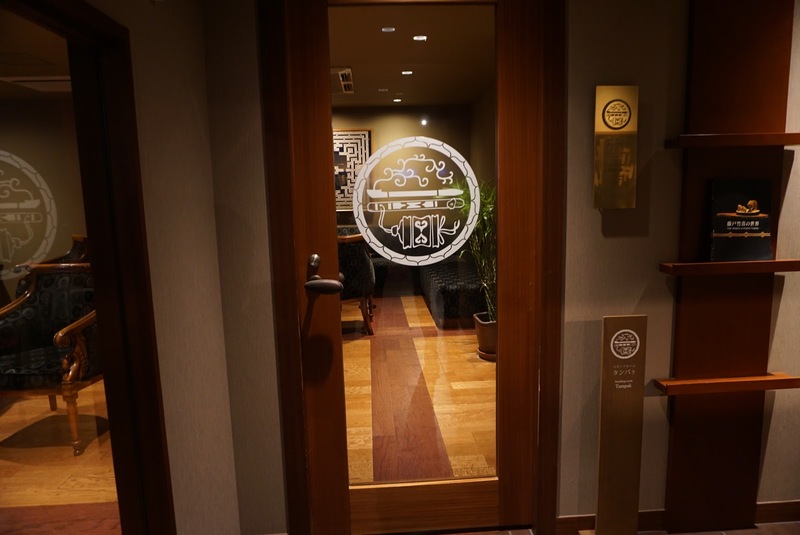 Onsen is located on the 3rd floor for male guests and 2nd floor for female guests. 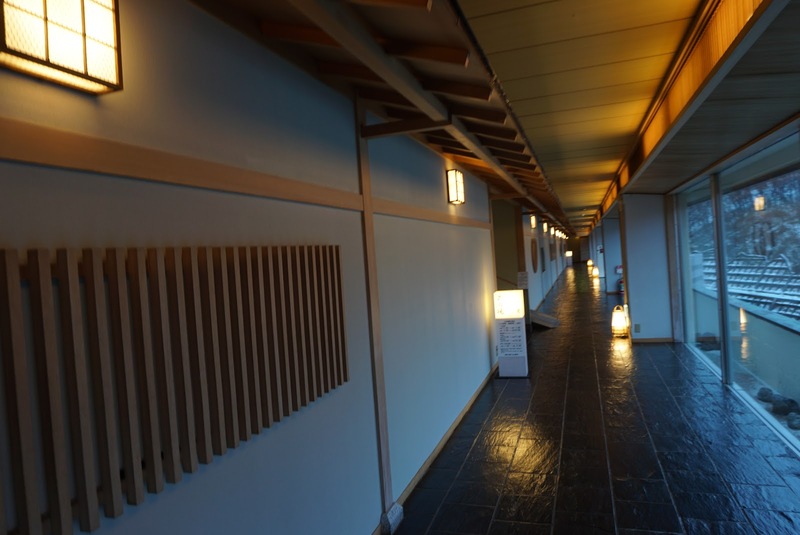 The onsen is rather small in Lake Akan Tsuruga Wings Hotel. In the male onsen, there are 6 onsen pools with temperatures varying from 38.5 ℃ to 40.5℃. 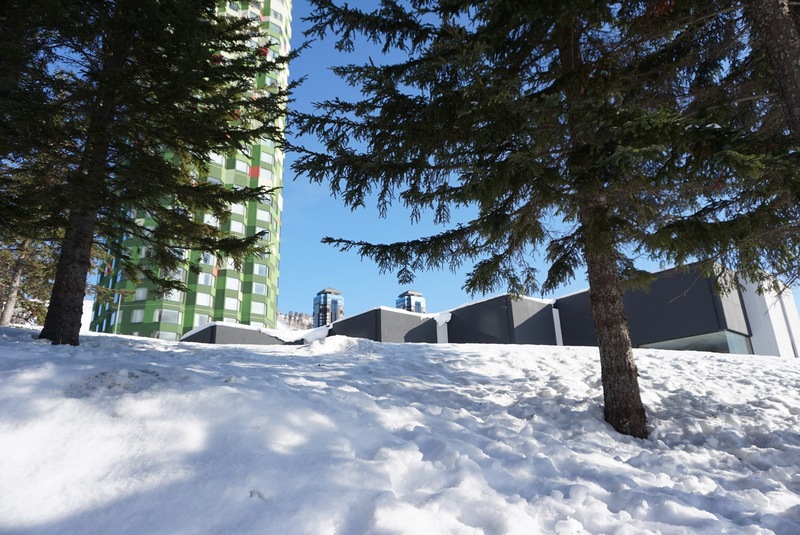 A steam room and sauna is built in the onsen area. 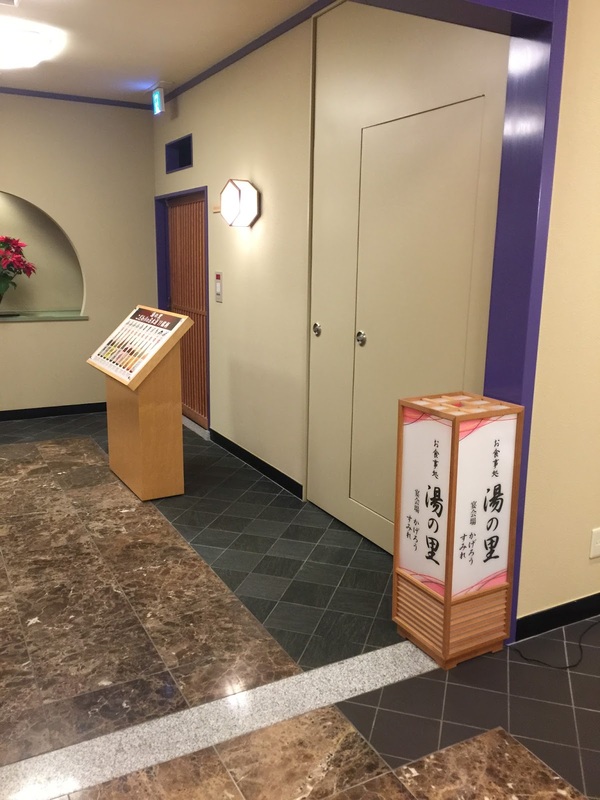 Guests in the hotel can also use the onsen in the sister hotel next door. 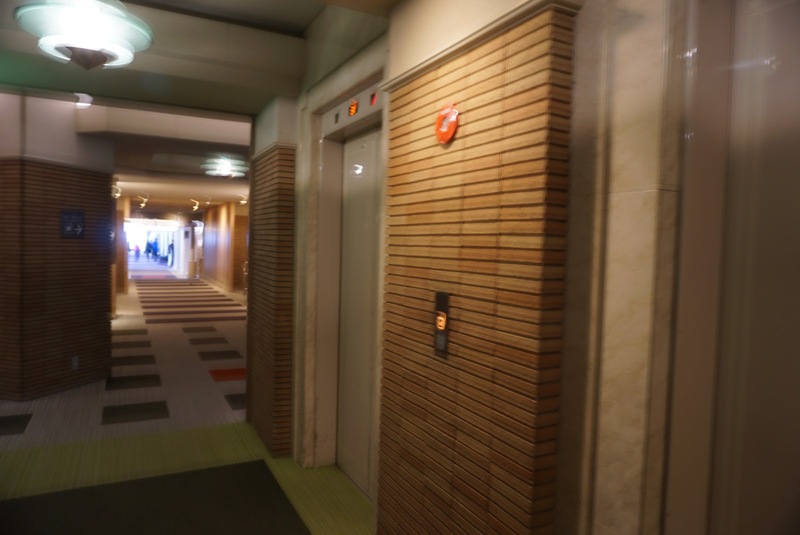 The onsen in the hotel next door is bigger and has more onsen baths, located on B1 and 8th floor. 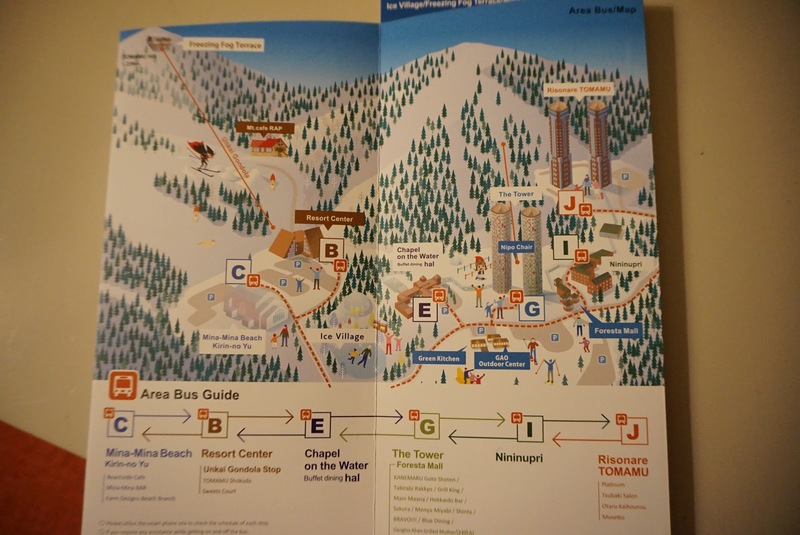 Information on the onsen found in the lift of Lake Akan Tsuruga Wings Hotel. 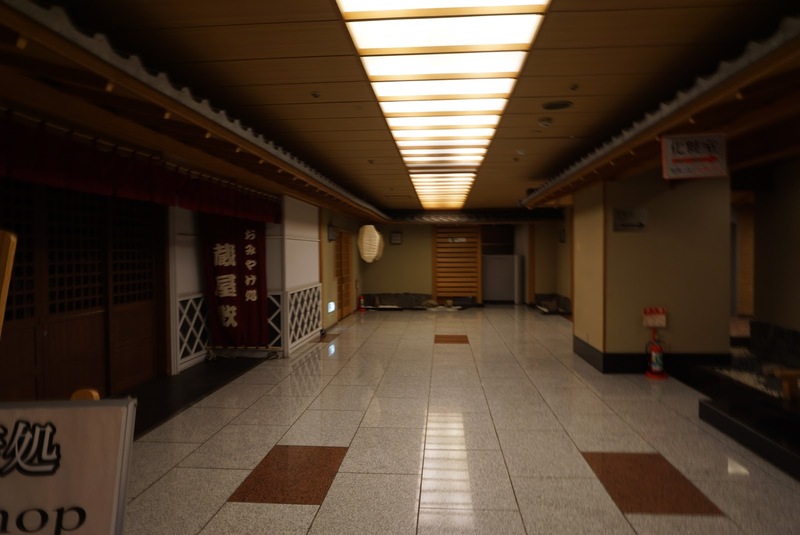 I did not manage to take photos of the onsen due to the no cameras allowed in the onsen area policy. 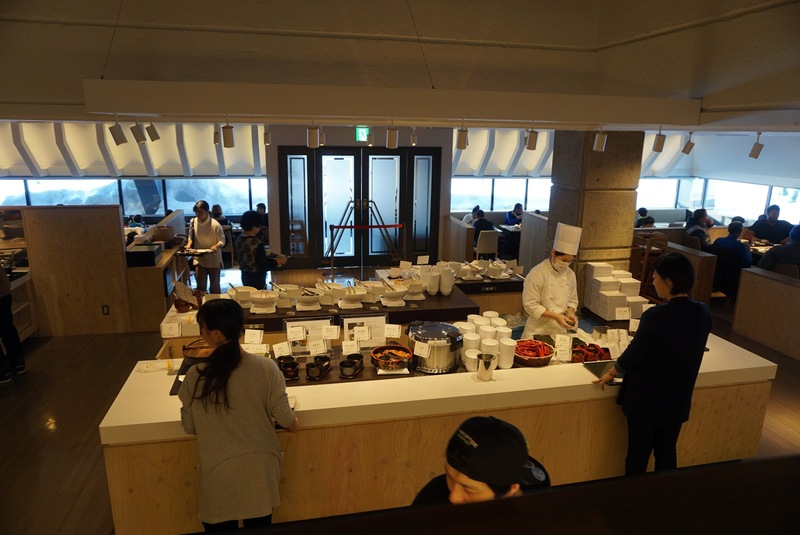 Meals are served in Hapo Restaurant next to the lift lobby of Lake Akan Tsuruga Wings Hotel. The restaurant is very big and seem to be able to cater to all the guests in the hotel at one go. 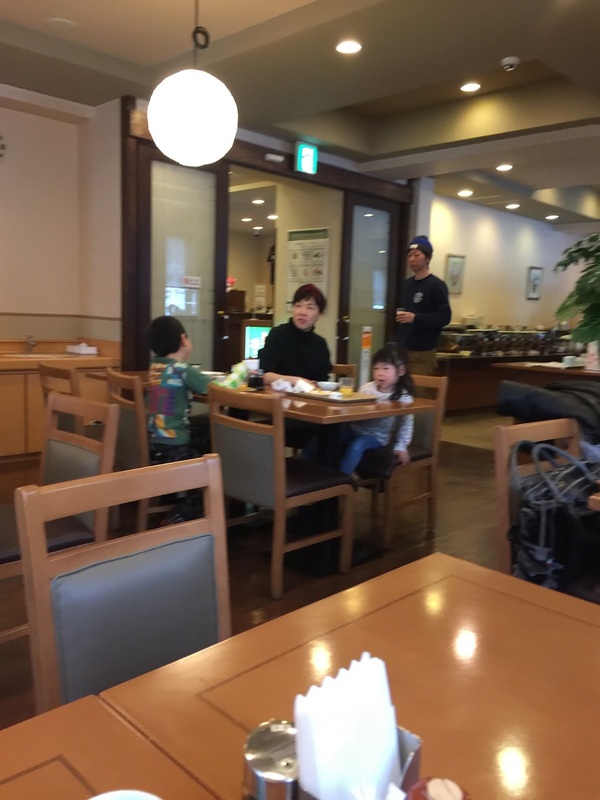 There are Japanese and western options for both breakfast and dinner. 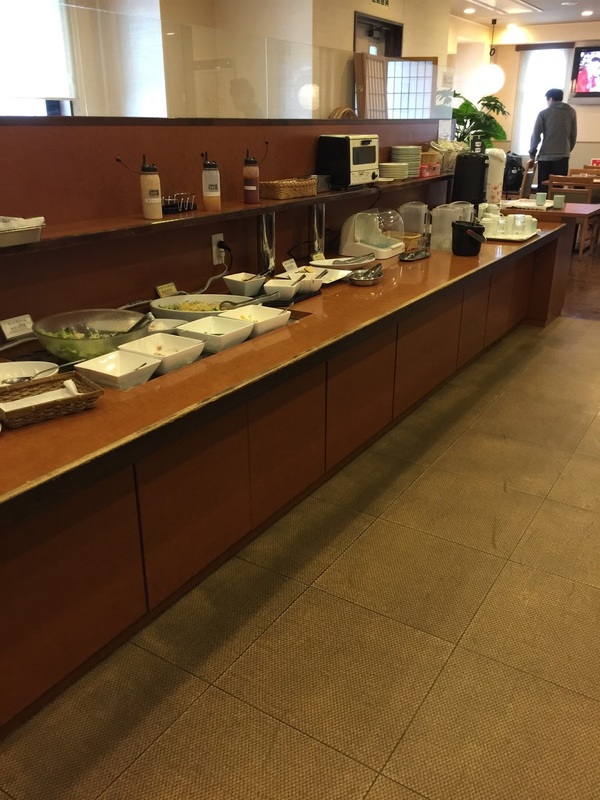 For breakfast, there are the standard american style with dishes like croissant, danish, and assorted bread. There are also things like eggs on offer for breakfast. 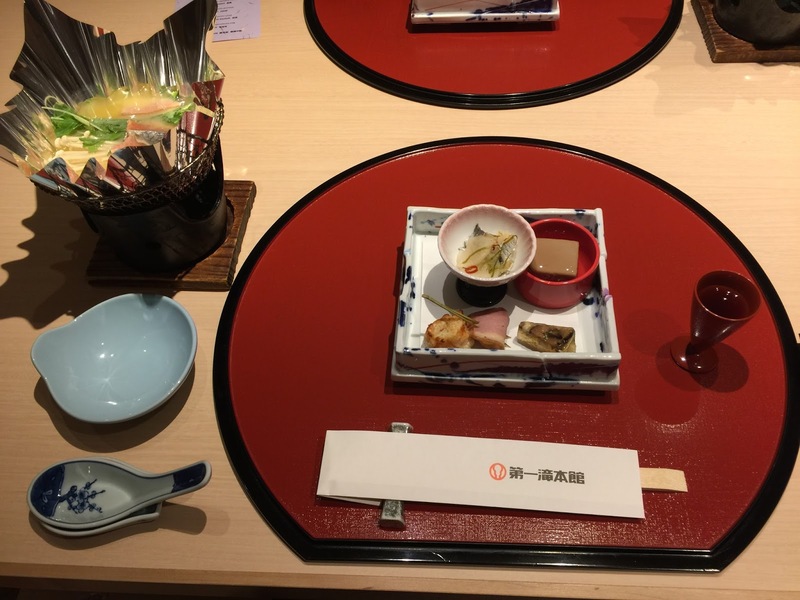 Japanese options such as sushi, miso soup, rice and onigari etc are available. The spread for dinner is even more lavish. 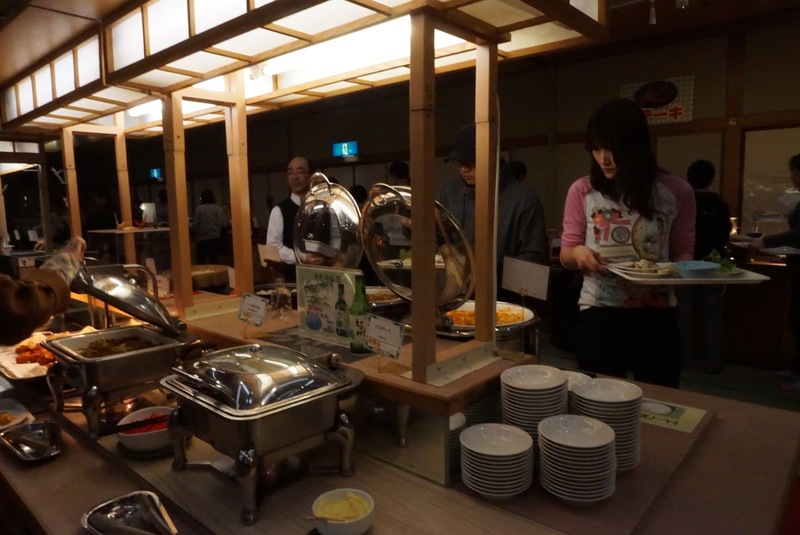 Other than cooked dishes, there is an area serving cook to order dishes and a sushi station. 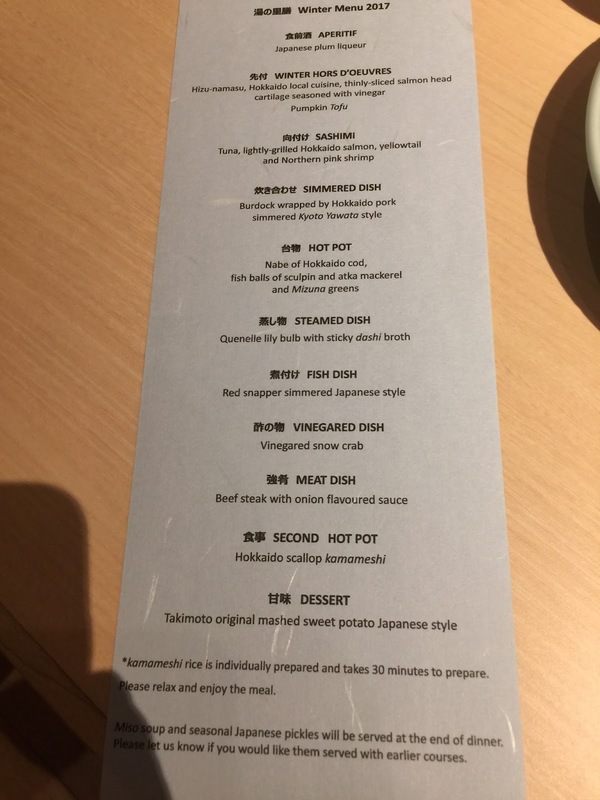 There are Japanese options for dinner as well. 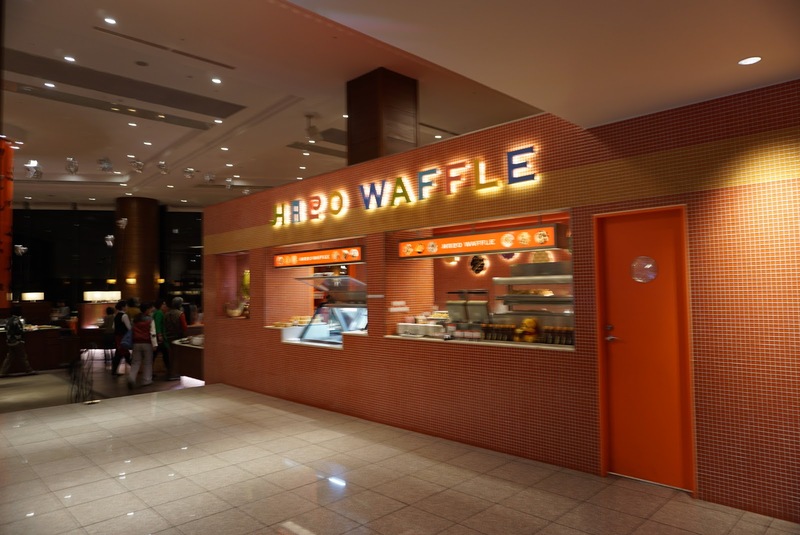 There is also another station with waffles and ice-cream. 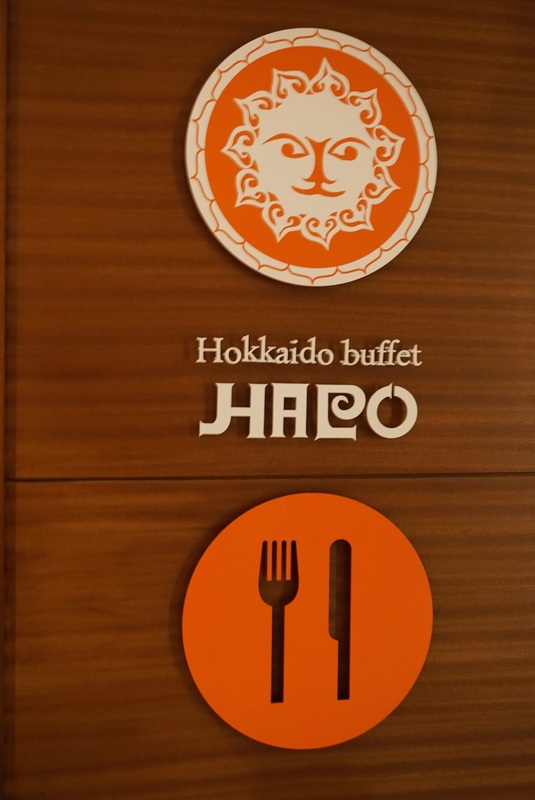 The food is delicious and the sushi tastes fresh in Hapo. 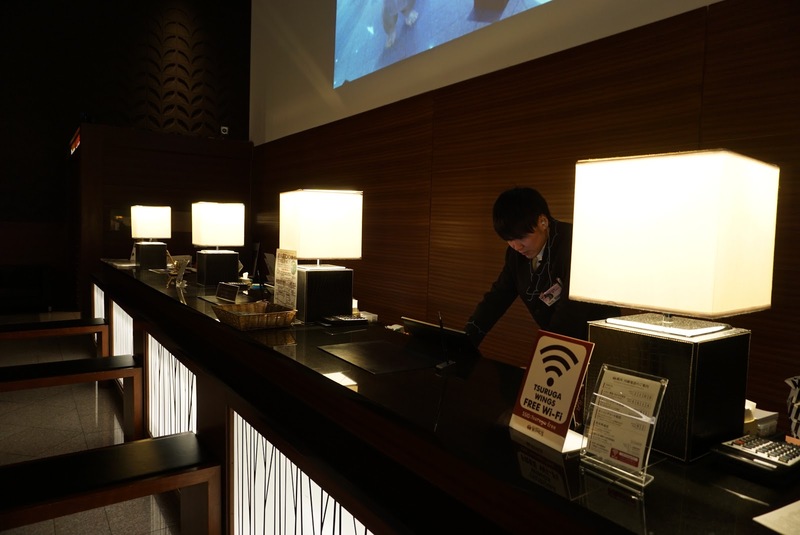 The service in the hotel is excellent, starting from check-in. Although the staff spoke very little English, this does not seem to be a barrier for them to delivery excellent service. 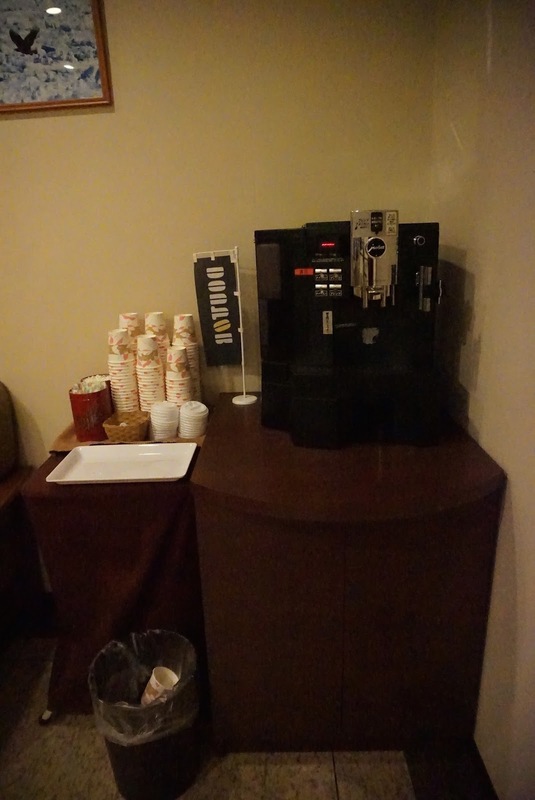 The good service started at the reception during check-in. 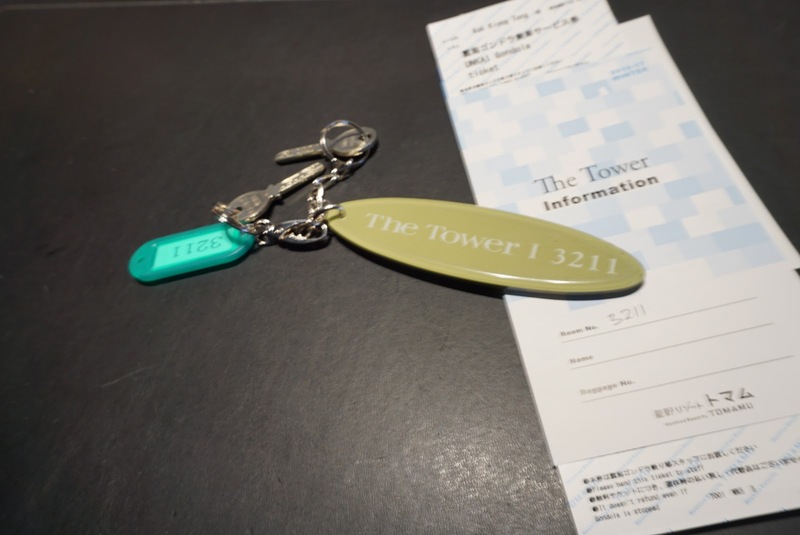 The staff, always with a smile, expeditiously processed my room and handed over the key to the room without having me staying there for longer than necessary. 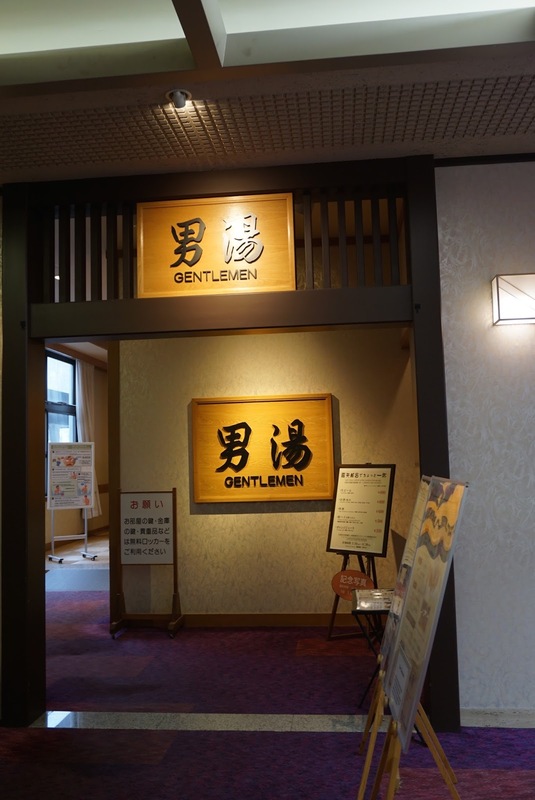 The staff also carefully brief me on the onsen arrangements and the place for dinner. I requested for extra pillow in the room and the staff responded to my request within minutes. 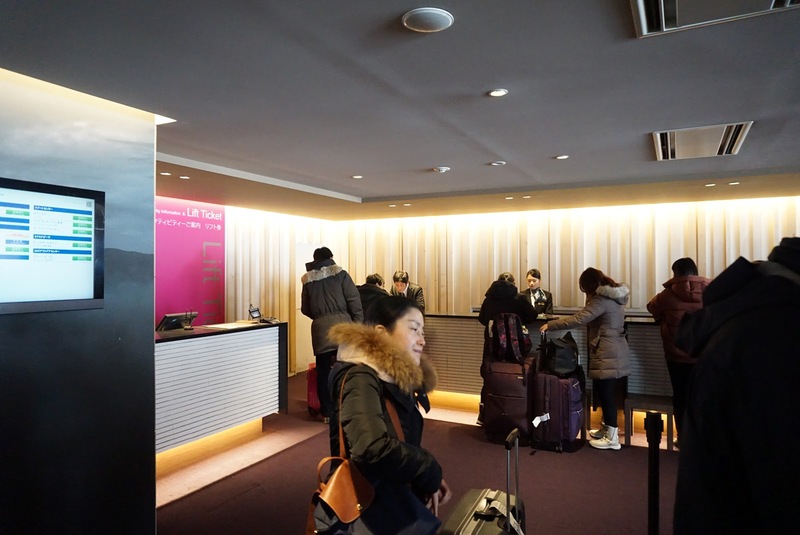 The front desk staff were also seen helping guests with their luggage. 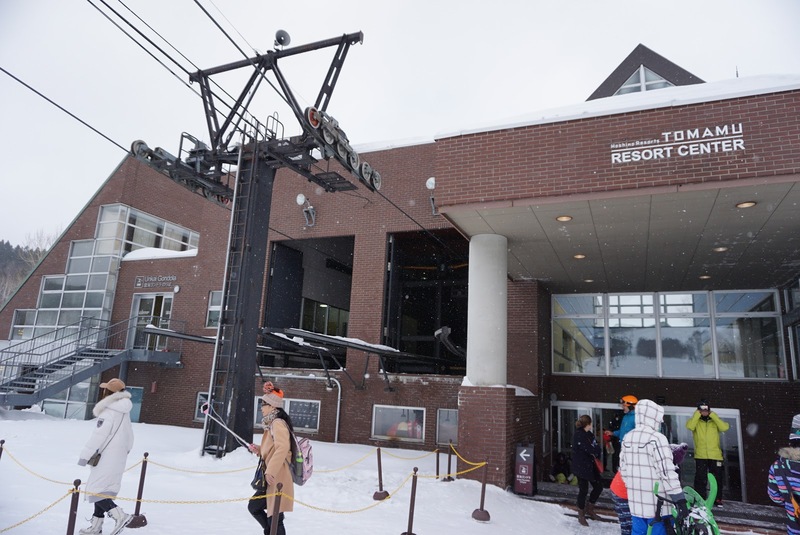 After checking out, when boarding the bus arranged by the hotel for my next stop in Hokkaido, staffs were seen braving the cold weather sending guests off with the Japanese bow. The service at Hapo is excellent as well. The staff at the front of the restaurant, always smiling, quickly got another staff member to show me to my table for dinning. The staff whom showed me to my table took the trouble to explain where various food are located and departed with a bow and a smile. They did this every time I went to the restaurant for food. The housekeeping team relentlessly prepare the futon in my room every evening, ensuring they are ready by the time I return after dinner. Futons are put away every morning, the room is ready for day lounge mode after I returned from breakfast. 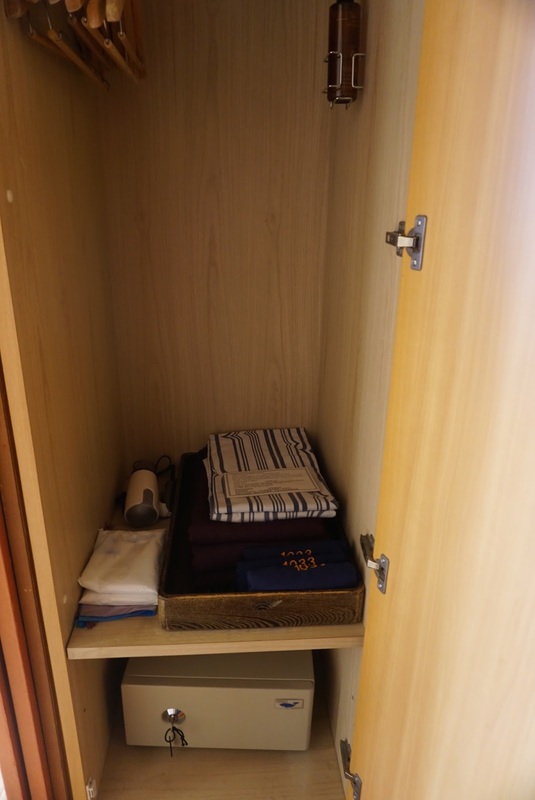 Rooms are kept spick and span every day, with bathroom supplies topped up. 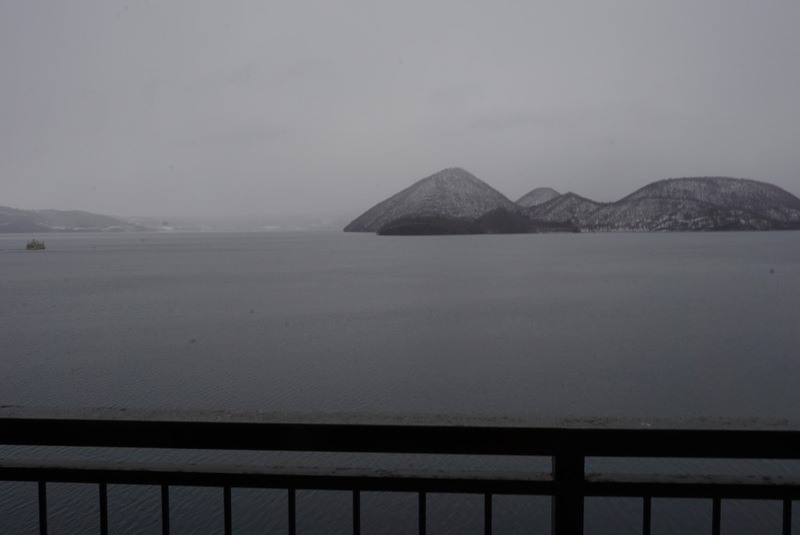 Lake Akan Tsuruga Wings Hotel is a great place to stay in Akanko Onsen. 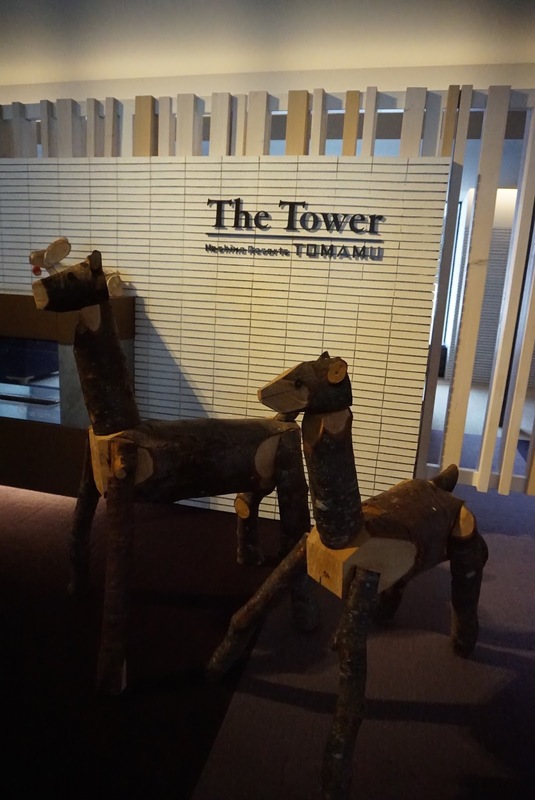 The hotel lobby is practically an art gallery showcasing Ainu sculptures and Ainu artefacts. 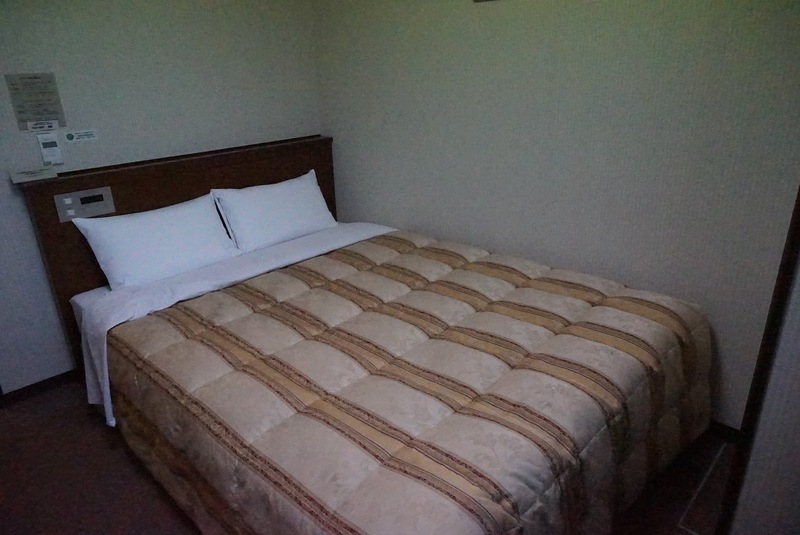 The sleep quality is excellent and the room size is great. I particularly like the lounge area in the room, which is a great place to relax in while the view of Lake Akan from the lounge area is fantastic. The service rendered by the staffs is exemplary. They made me feel very welcome in the hotel. 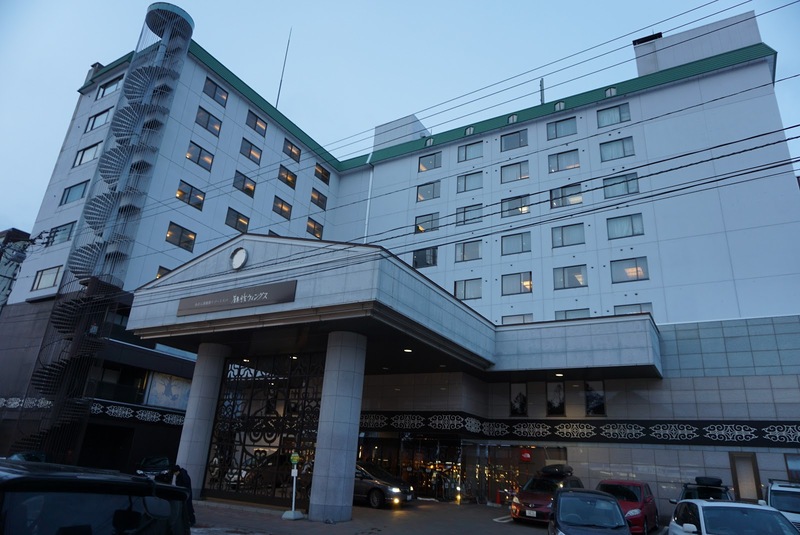 Despite the small onsen in Lake Akan Tsuruga Wings Hotel, guests are welcome to use the onsen facilities in the sister hotel next door, giving guests more than 20 onsen baths to enjoy. 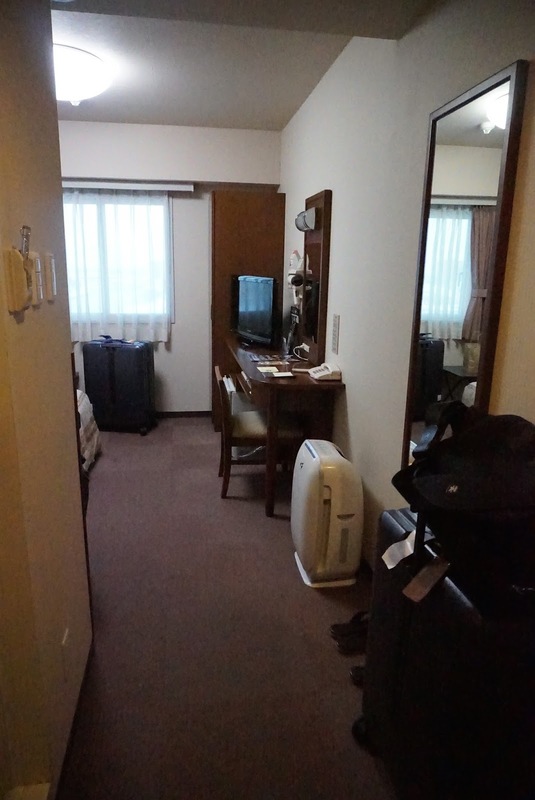 At the price, with the half boarding arrangement, Lake Akan Tsuruga Wings Hotel is a value for money stay in Akanko Onsen.